Click here to go to my 2008 diary. 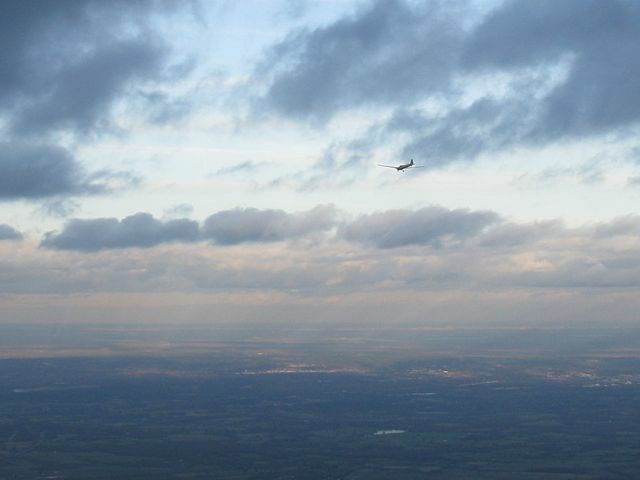 An unexpected bonus soaring flight in freezing cold polar air as it streamed down from the North. 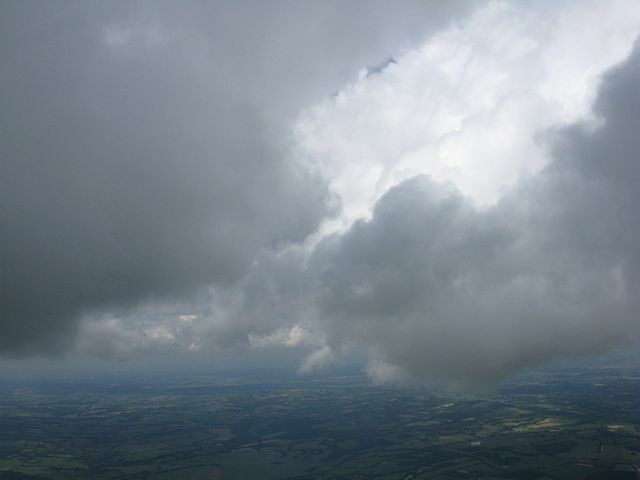 Without doubt the highlights were multiple occasions when I was able to get above cloudbase. 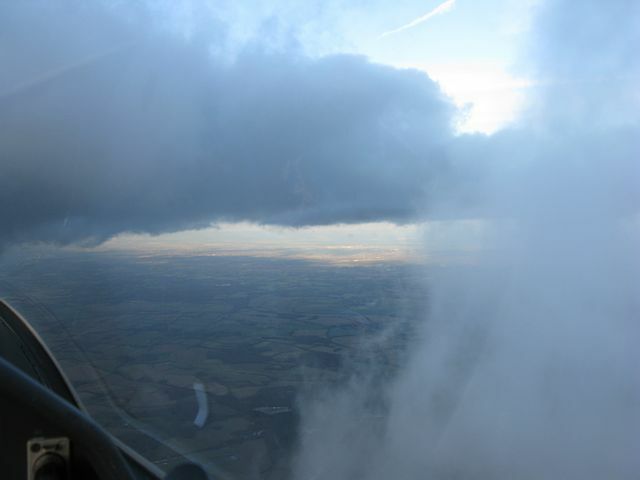 In each case I was able to climb the side of the main cloud to an upper (stepped) cloudbase. 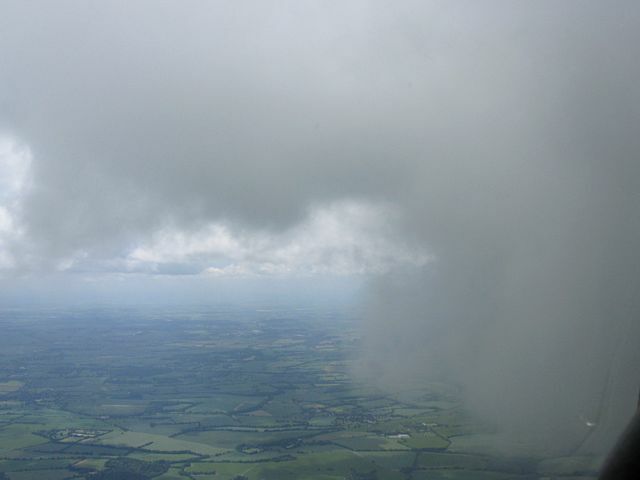 The last instance was spectacular, with a very turbulent 6-8kt burst that pushed me about 800 feet above the lower cloudbase. 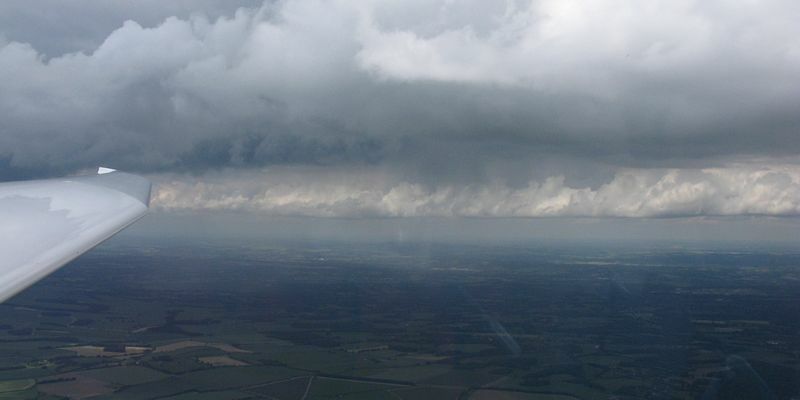 I was stopped not by the upper cloudbase, but by the airspace ceiling at 5500 feet. 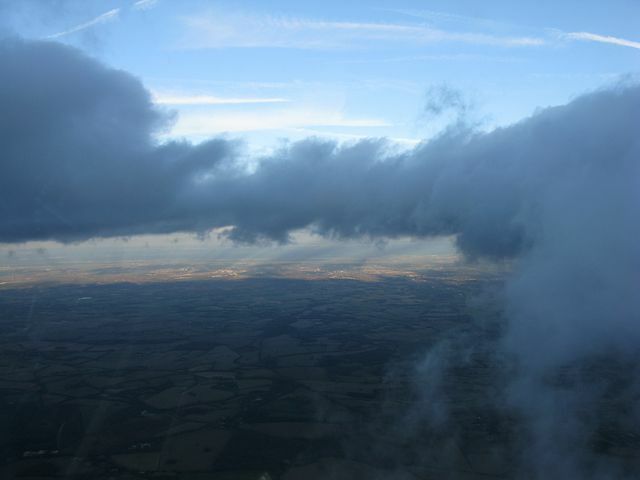 As usual the pictures do not do the views from above cloudbase justice. Pure eye candy. 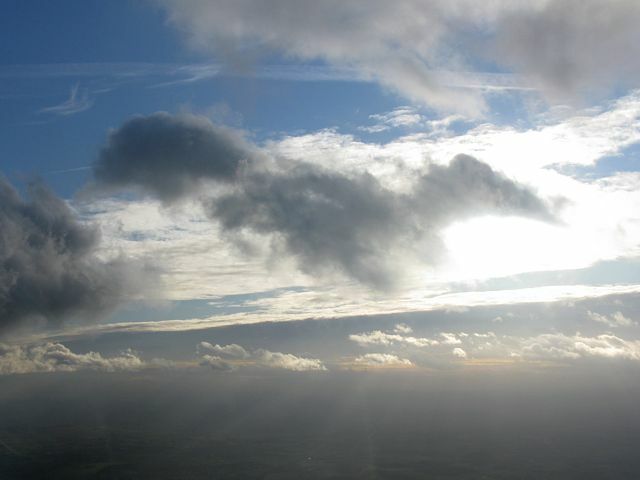 Especially with the low sun angle providing long crepuscular rays. 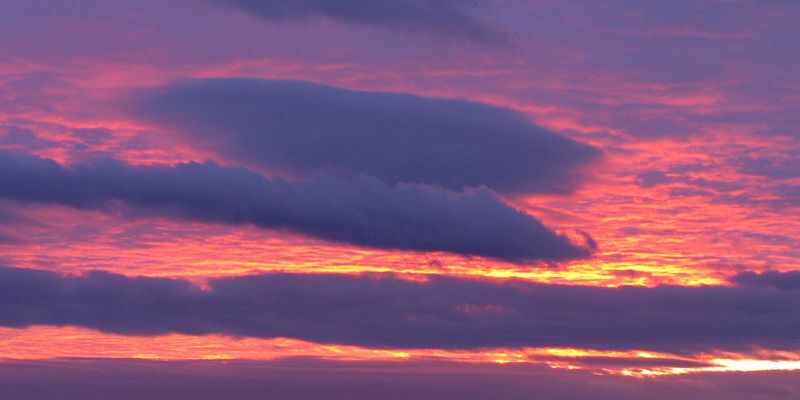 A hint of iridescence in wisps of cloud. 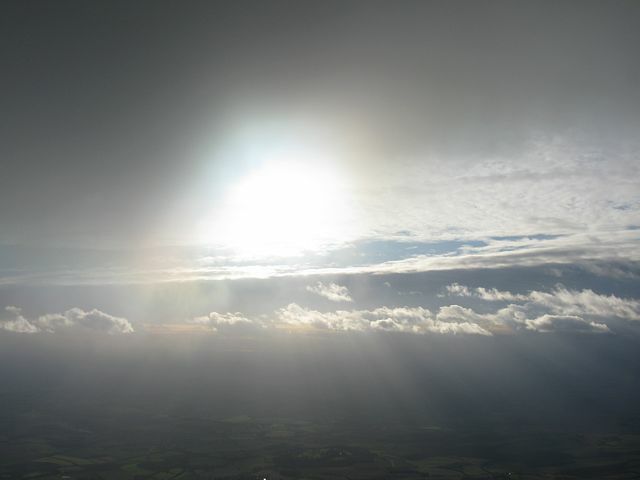 Looking away from sun to spot a partial glory. 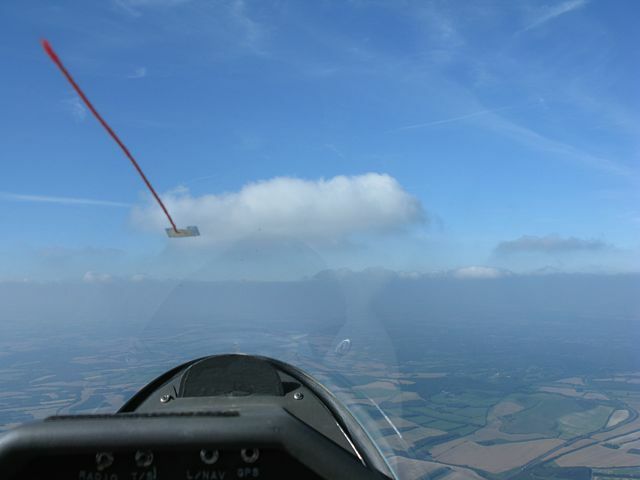 Flying through some more thin wisps. 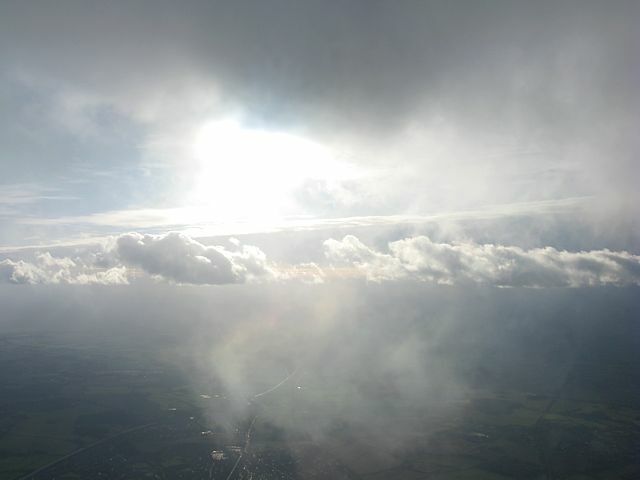 Looking away from the sun I could see crepuscular rays shining from over the clouds I was under. 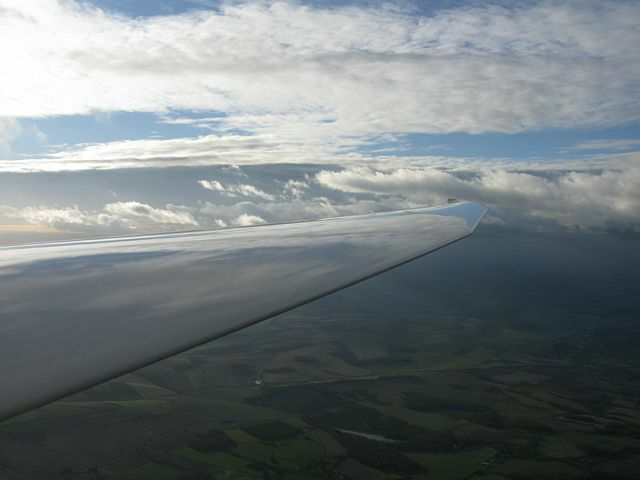 A cloudscape reflecting on my wing. 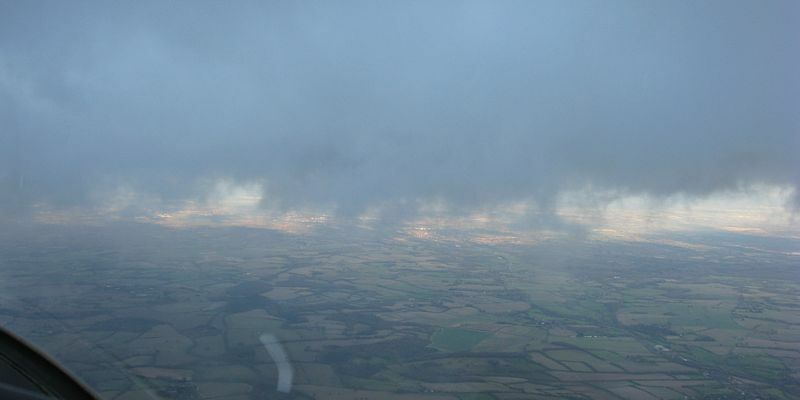 Back below cloudbase thermalling at 3kts. 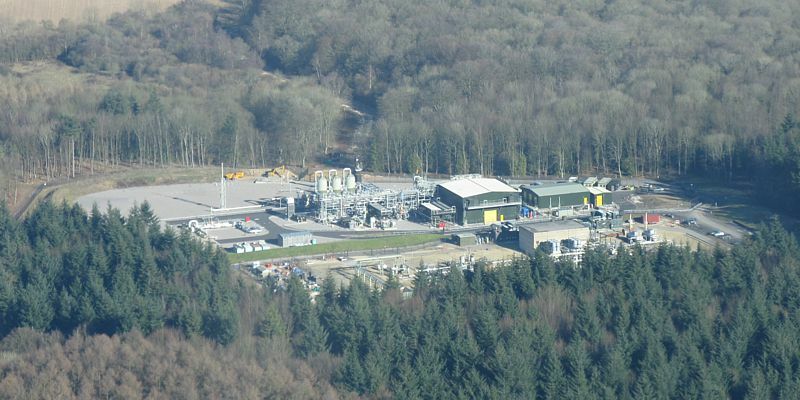 Looking north, Aldermaston is lower right. 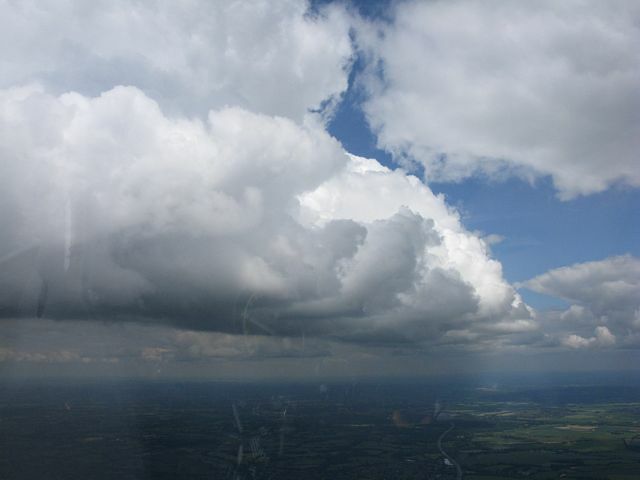 Arty shot of a cloudscape. Looking back South. 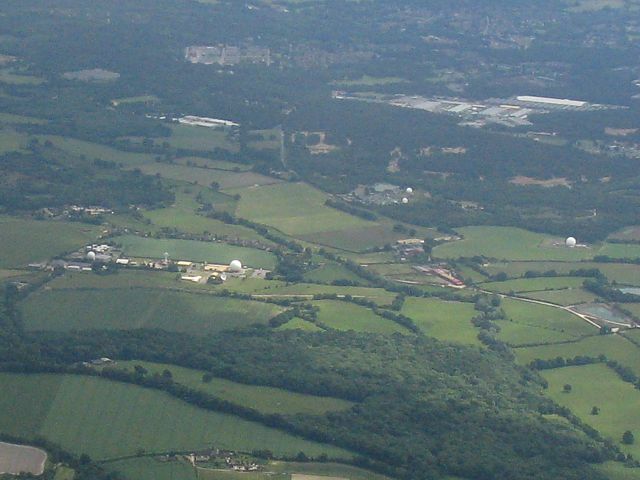 Basingstoke and Lasham both visible. 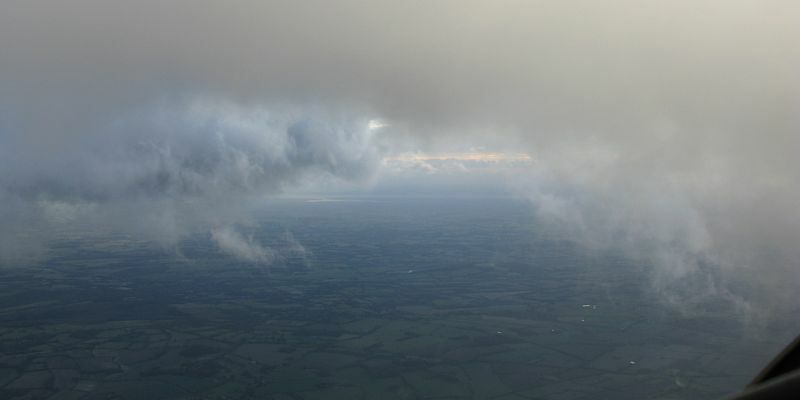 Two more cloudscapes from cloudbase. 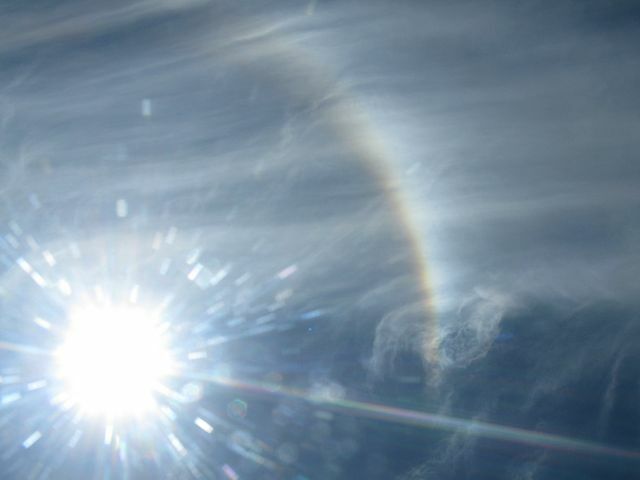 Iridescence around the sun didn't show well in the picture alas. 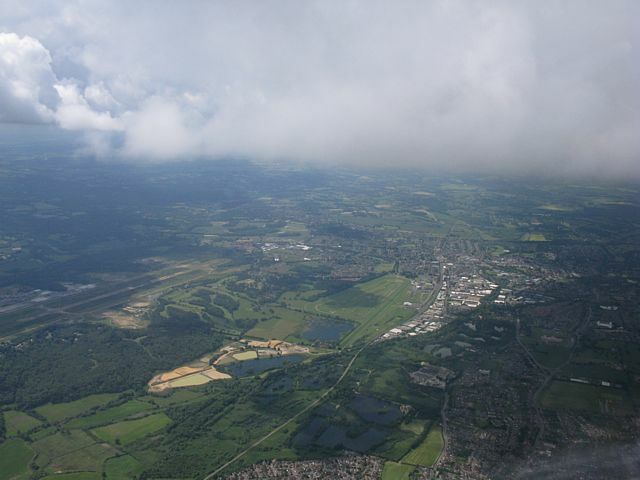 Peering down at Basingstoke from above a wisp of cloud. Looking South. 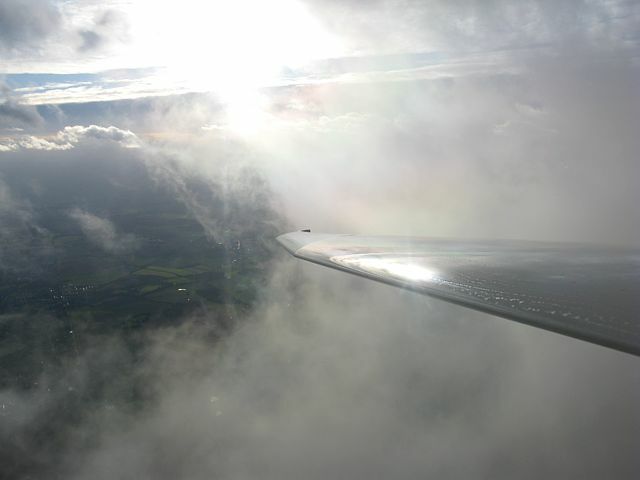 Faint iridescence reflecting on my wing. 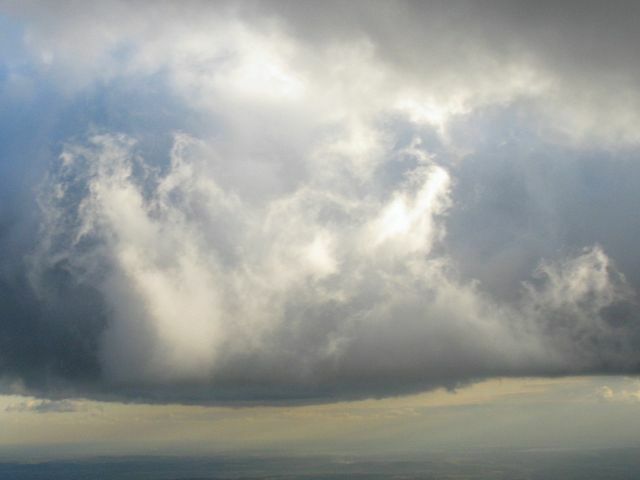 Another closeup cloudscape. Another attempt to photograph a closeup glory. Another look to the South along the street. 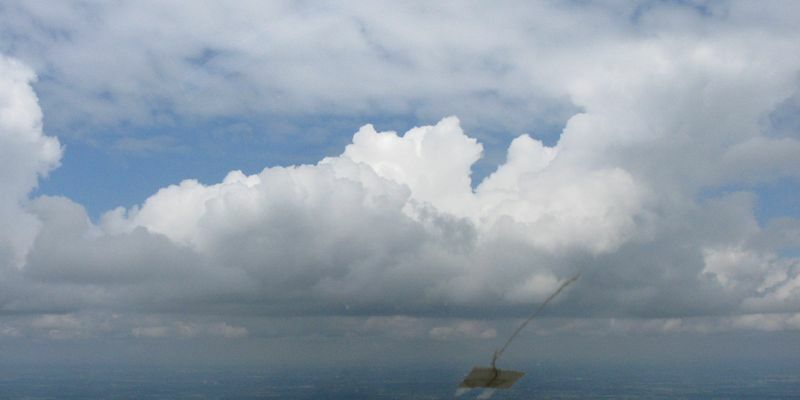 The cumulus getting quite big. 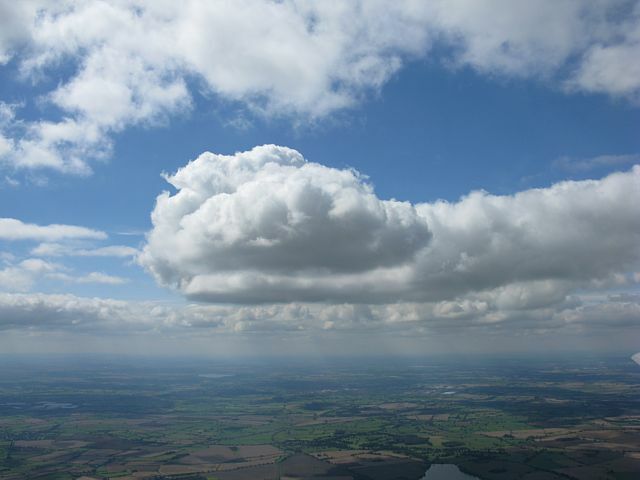 Another cloudscape. More crepusculars looking away from the sun. 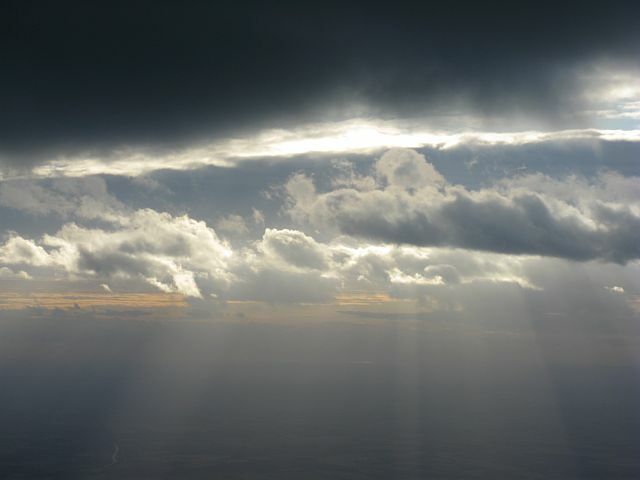 More crepuscular rays as I look towards the sun. The low sun made for some pretty shadows and pleasing colours. 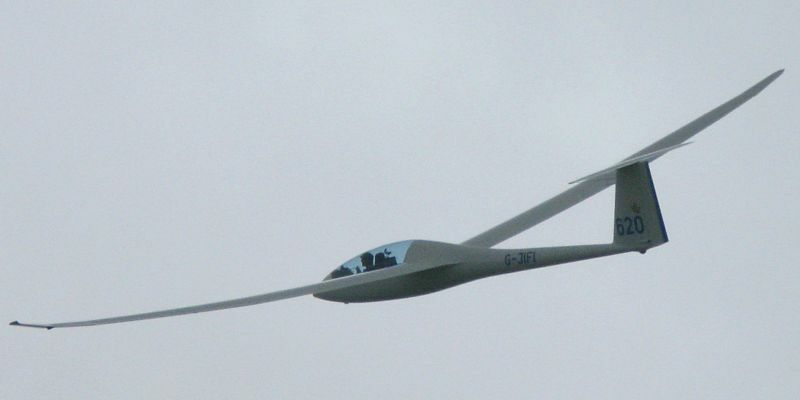 Another glider also soaring under my cloud. 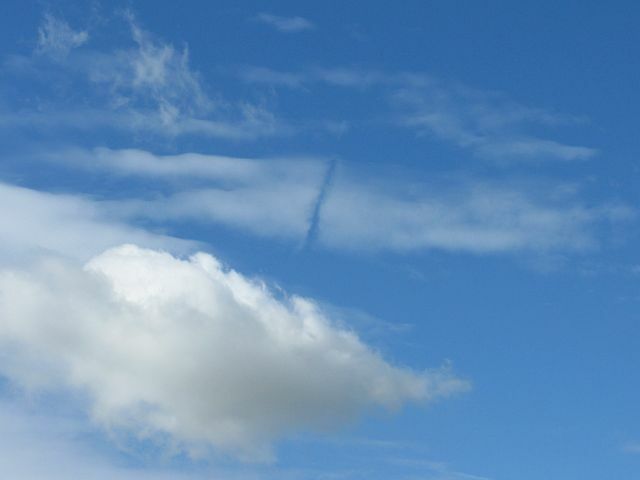 This cloud looks like it's being ripped apart like cotton wool. 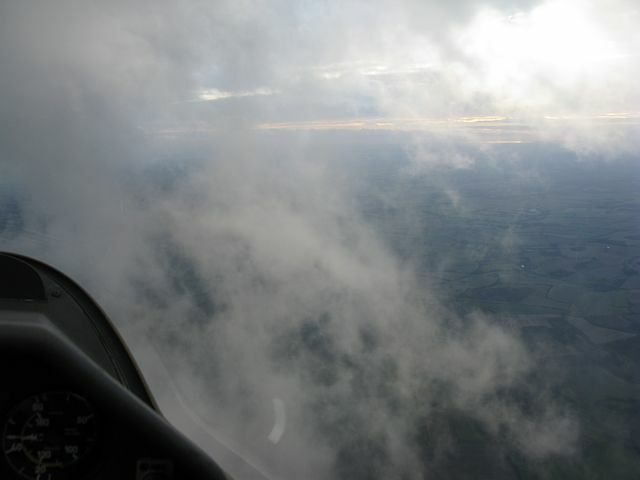 Flying above wisps nearer to Lasham (visible in second shot). 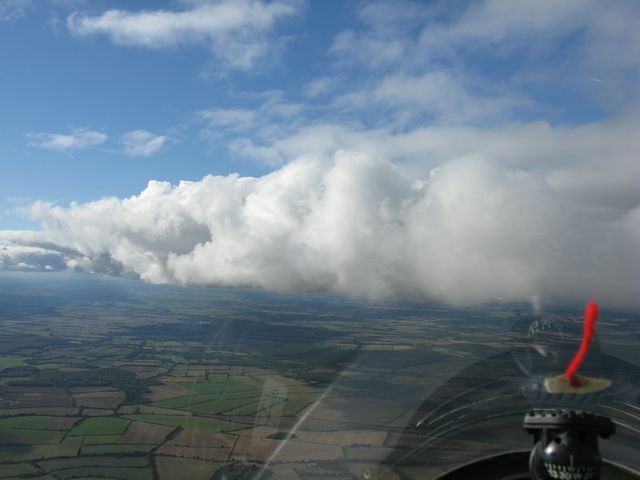 Clouds above Lasham Airfield. 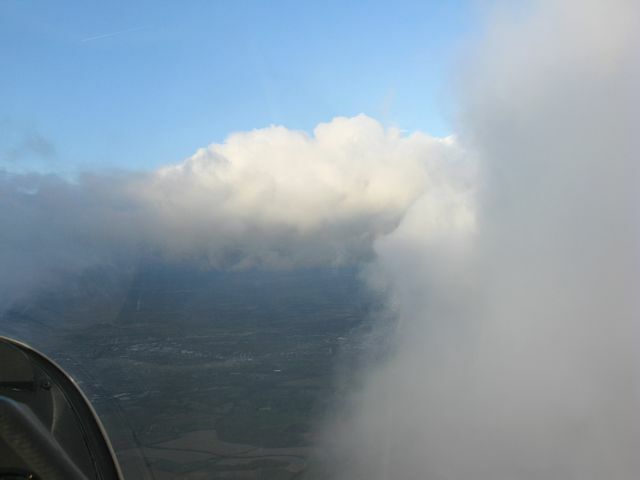 Peering through clouds towards the South Coast as I climb further above cloudbase. 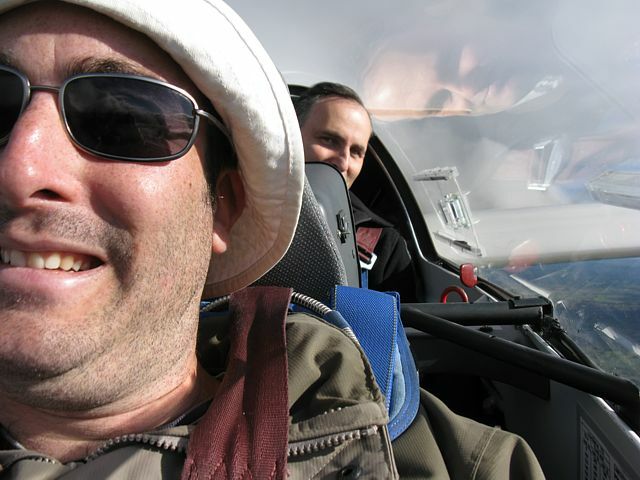 Sampling the turbulent lift as I approach TMA. Time to break off. Peering around the side of the street to look North up the West side. Looking into sun as golden hour approaches. 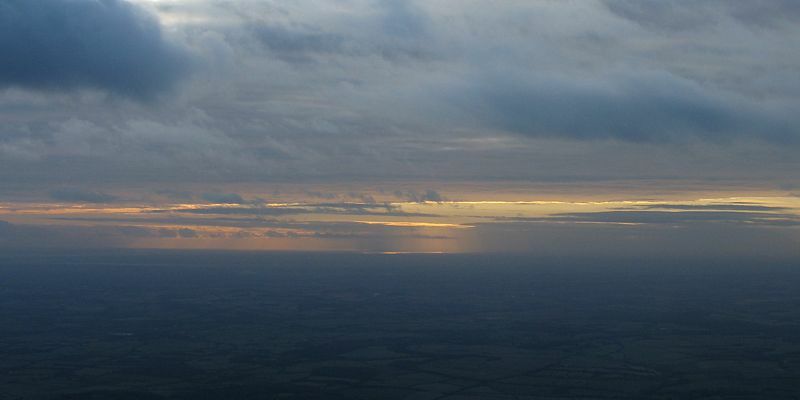 A small sunny gap between cloud and cloudshadow to the East. 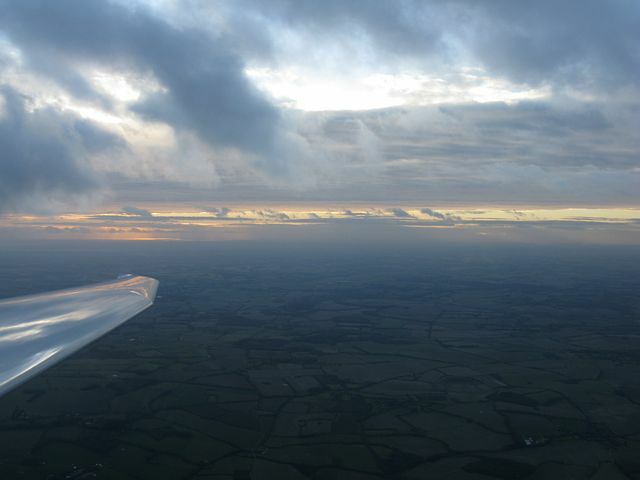 Going round the side of a cloud to reveal another spectacular cloudscape with crepuscular rays to the East. 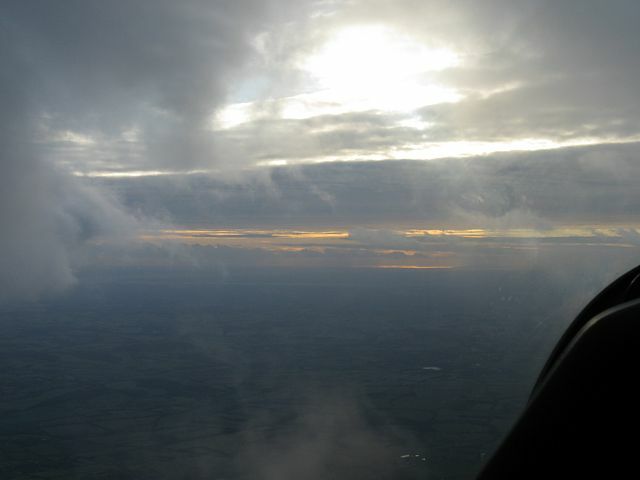 Now into Golden Hour as the thermals shut down and I start to sink slowly back to earth. 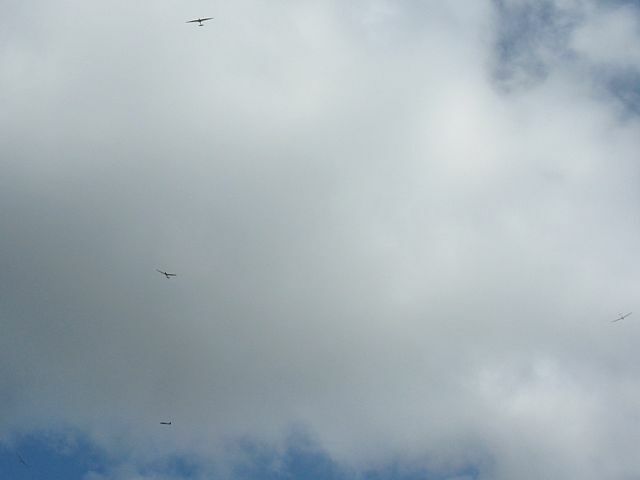 Watching the Falke soaring in the last of the thermals above me as light levels drop. 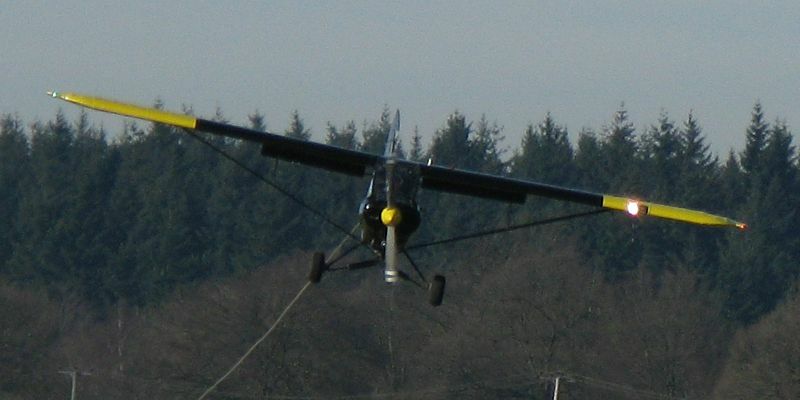 Back on the ground a K13 takes one of the last winch launches of the day. 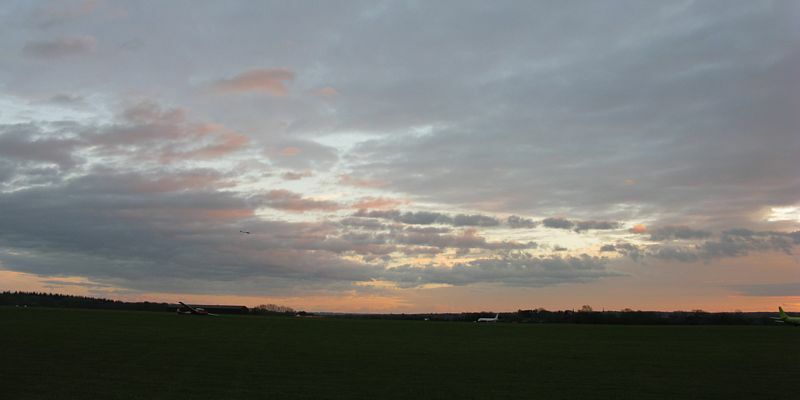 The beginning of sunset. 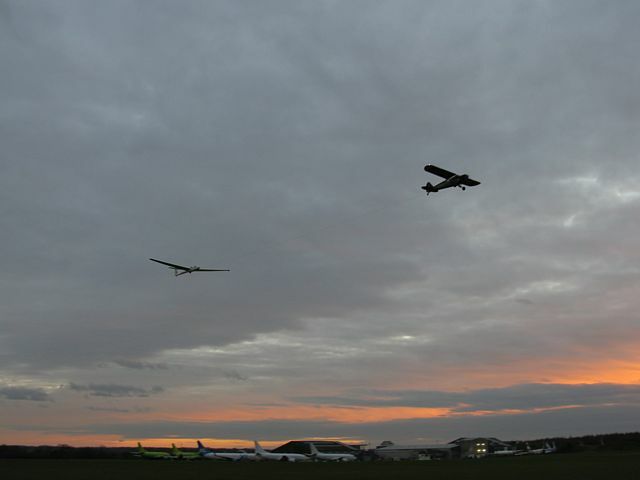 The last aerotow of the day. 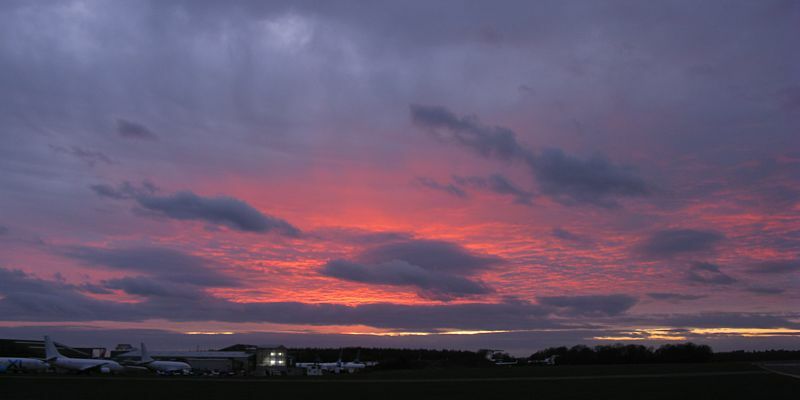 The sunset gets rather spectacular as it progresses. Late sunset the colours are spectacular. Even post sunset was worth a long 1 second exposure. 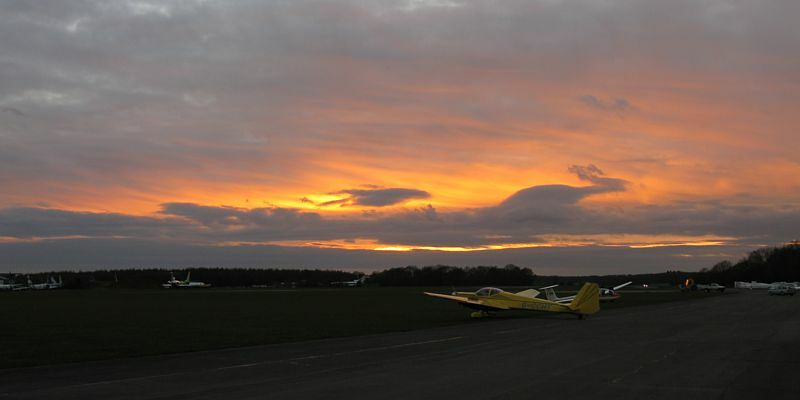 I went for a jolly with another Lasham pilot in the Lasham Duo Discus after I failed to get a single seater in the ballot. 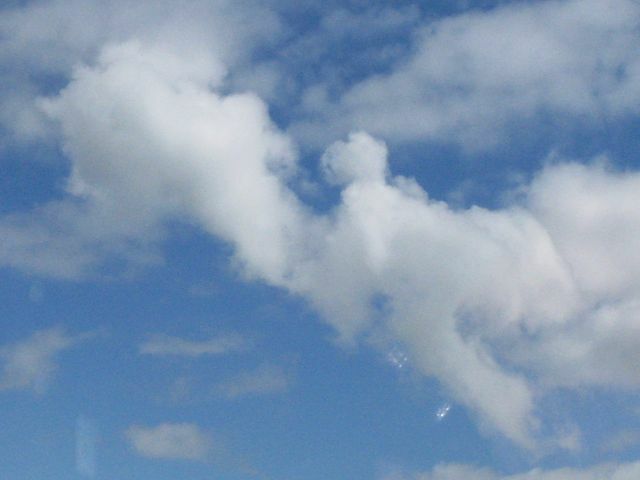 Is that a giant rabbit rampaging across the sky with a collection of smaller minions alongside? 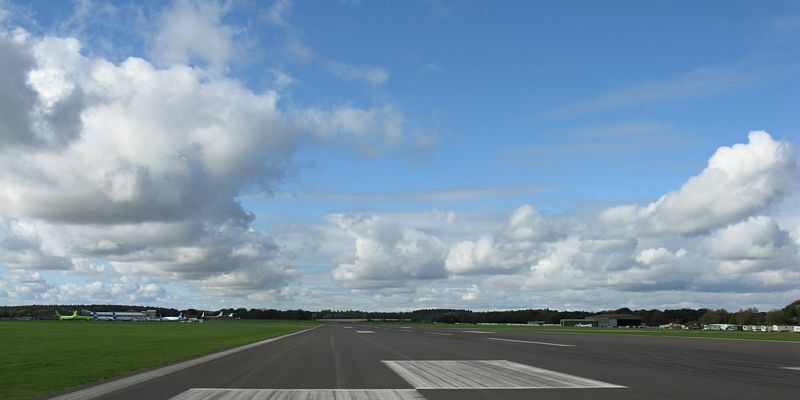 Looking East along the main runway as convection gets going. 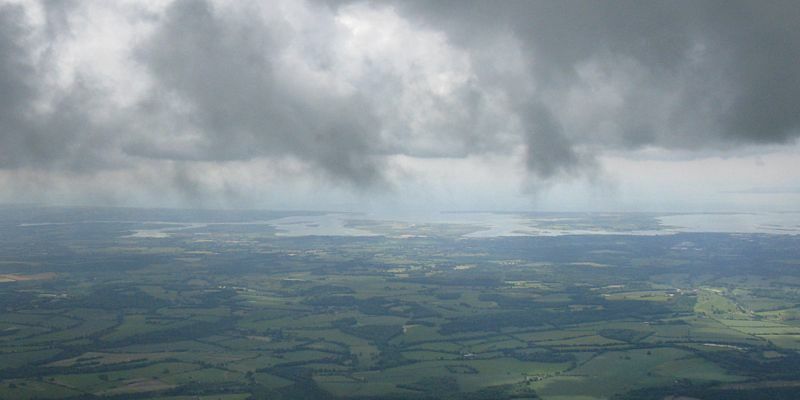 Looking South to Portsmouth and the Isle of Wight from Lasham. 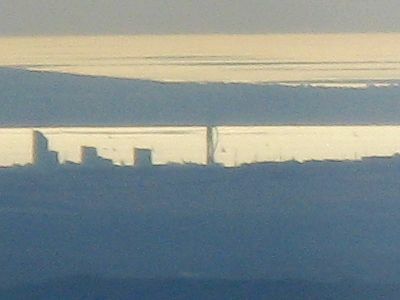 The Spinnaker Tower is visible in the zoom-crop of the same shot. 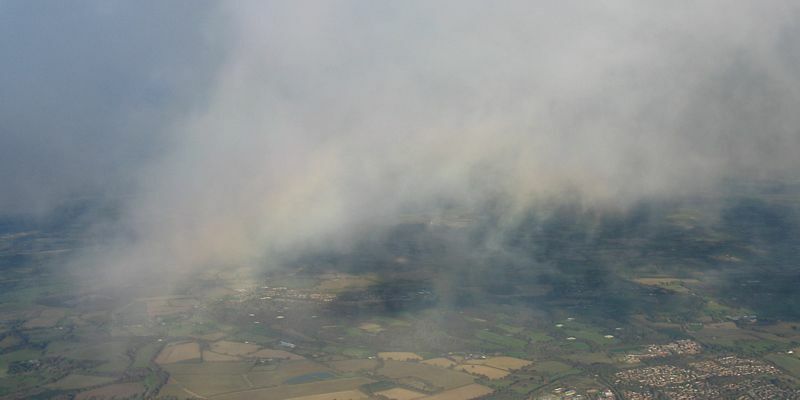 Looking North at Basingstoke under spreadout. 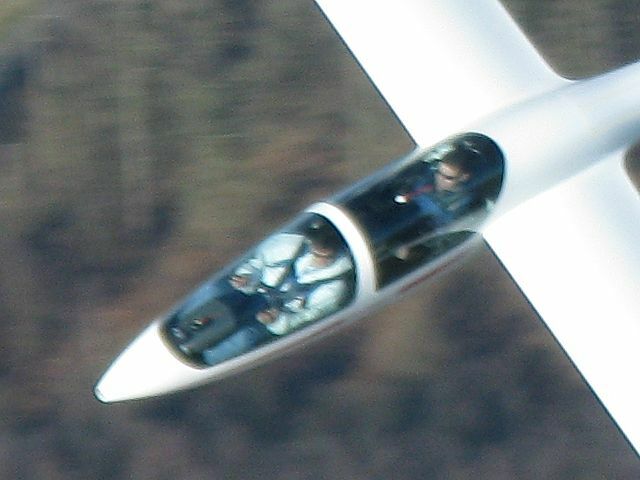 Soaring with another glider. 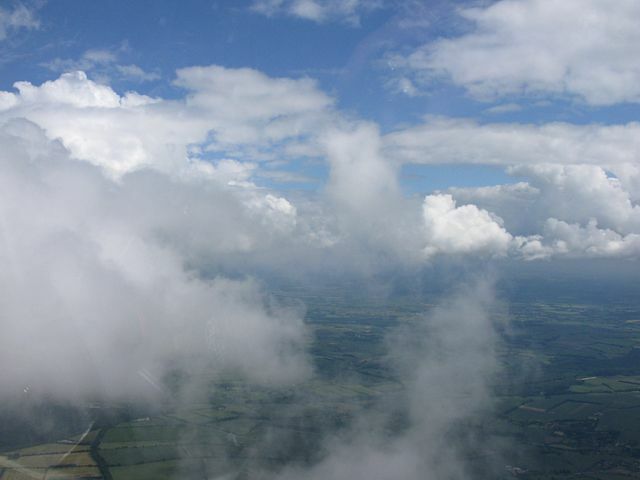 Having fun up at cloudbase. 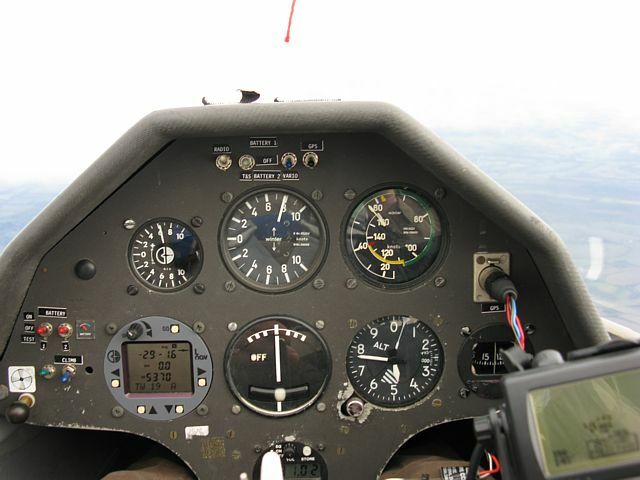 Me as P1 in the front. Alex Harris as P2 in the back. 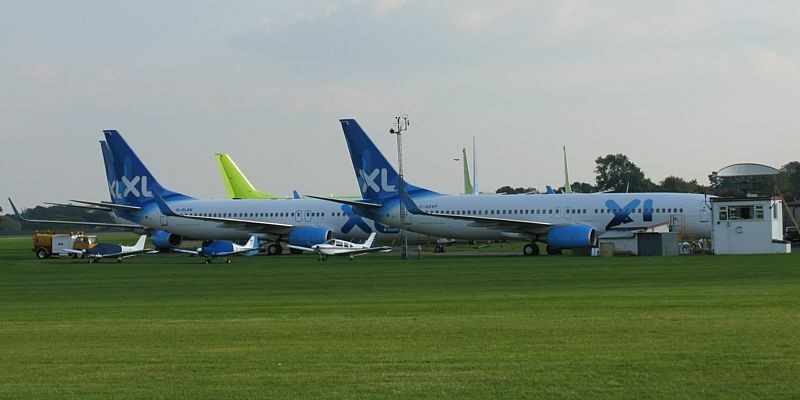 The XL holiday airline went bust last week. 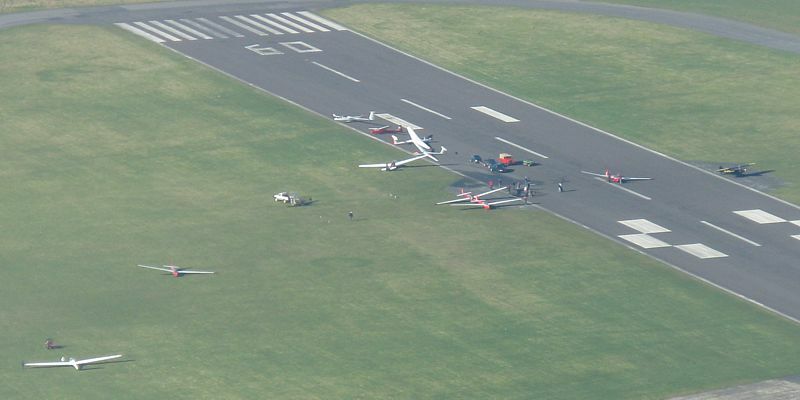 7 of the aircraft ended up at ATC Lasham. 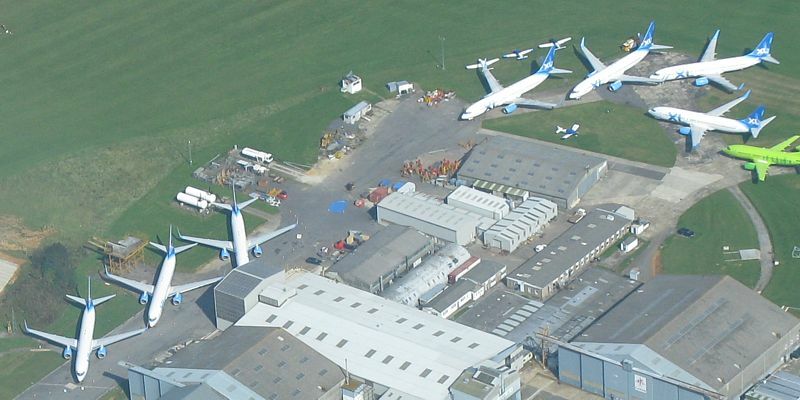 7 XL aircraft parked at ATC Lasham. 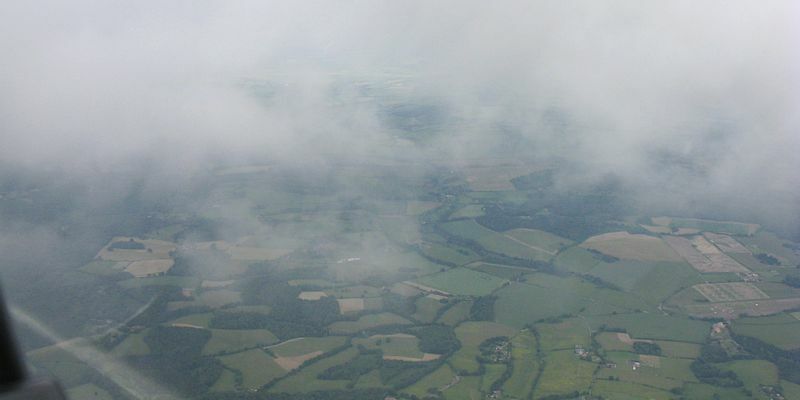 Seen from the Southwest. 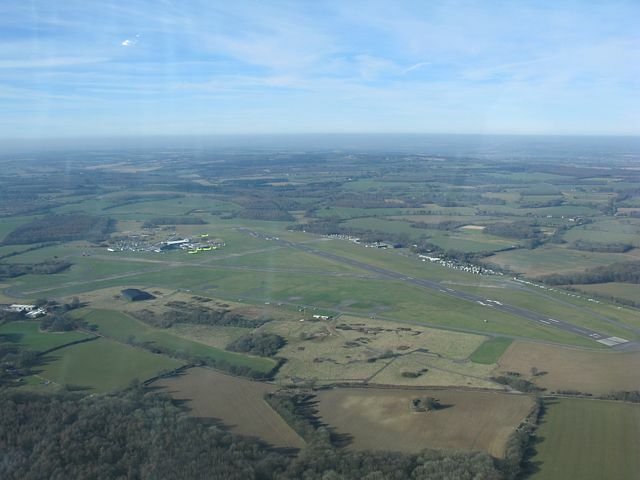 Looking at Lasham airfield from the West. 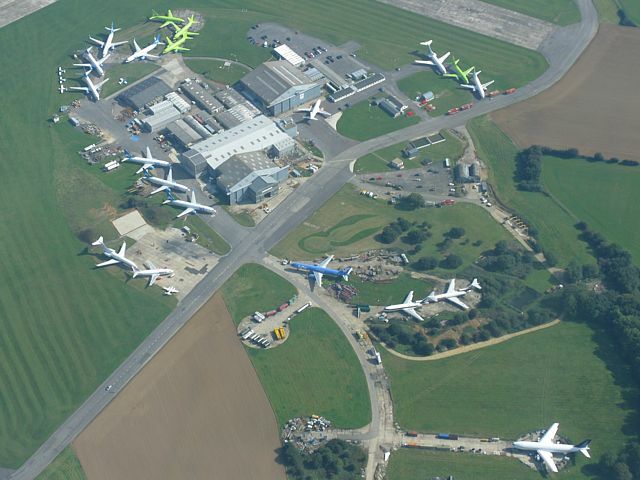 A wider view of ATC Lasham showing the XL aircraft and 13 other jets. Busy place! 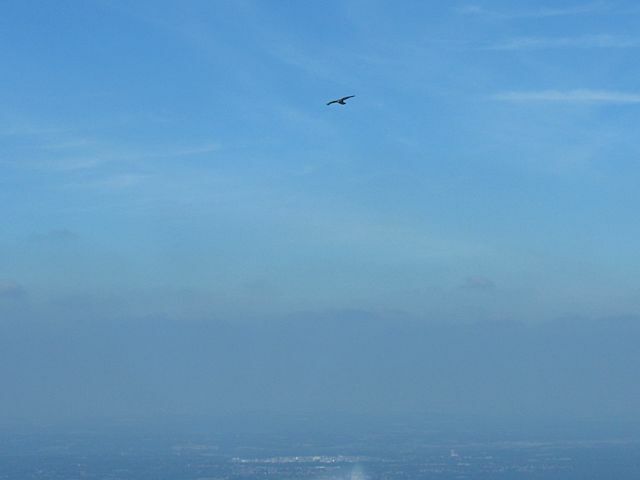 A buzzard soaring at a strong inversion. 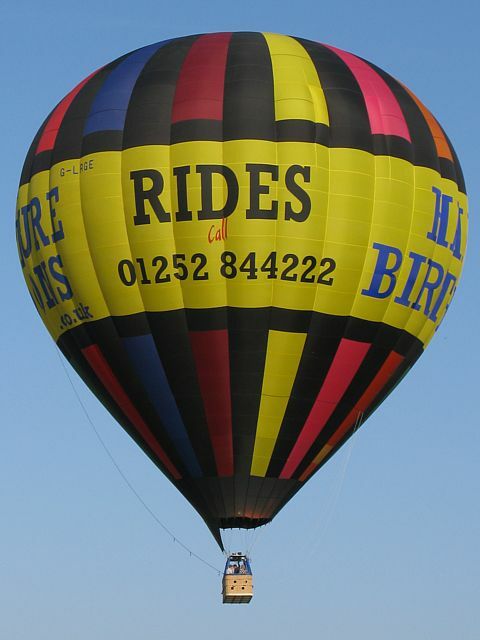 Soaring with the buzzard. 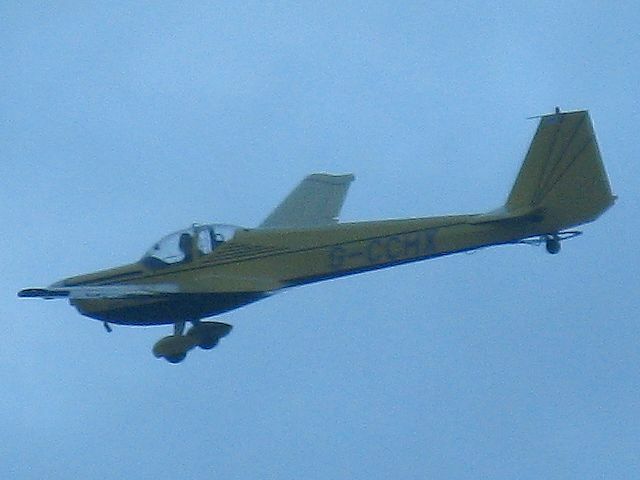 An Astir (I think?) 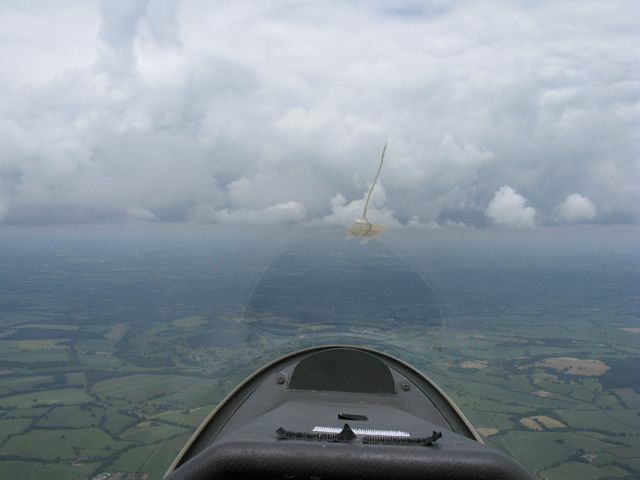 soaring with Lasham in the background. 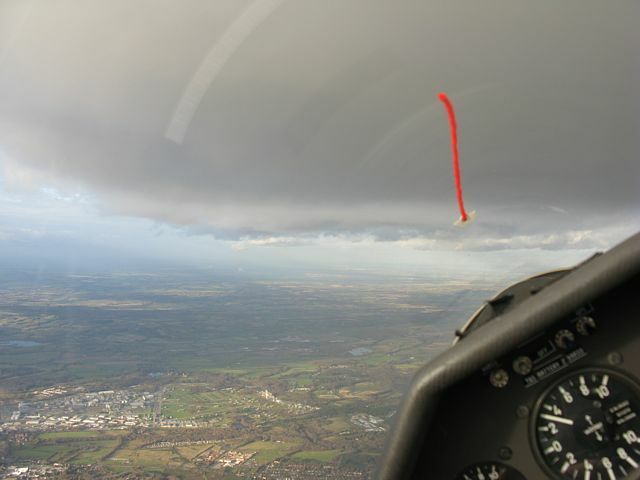 That was one strong inversion. 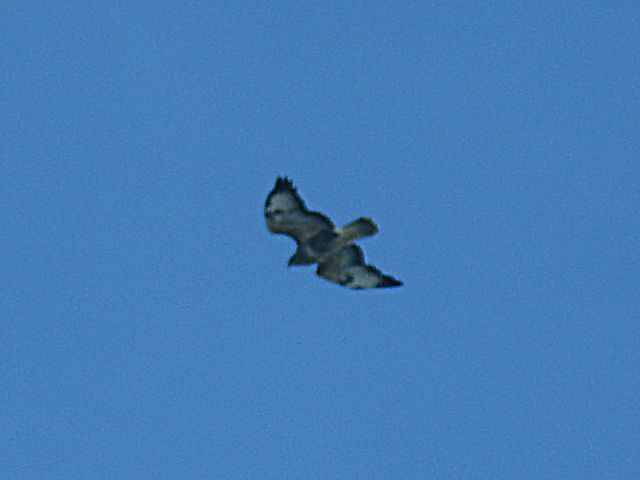 I did my best to rescue this off focus shot of a buzzard taken as I flew about 100 feet underneath it. 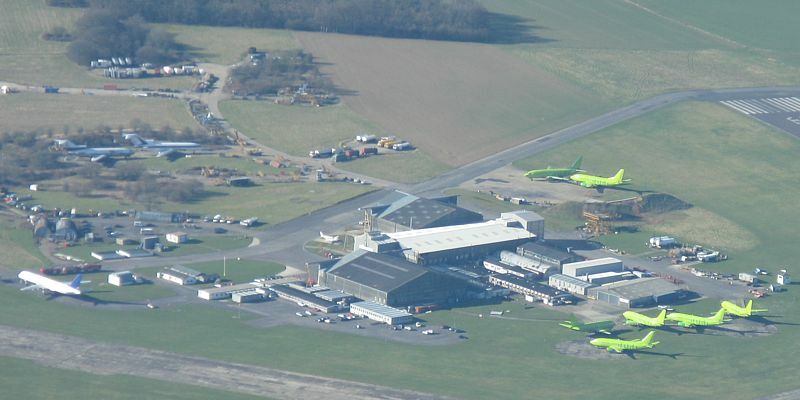 A view of 3 of the XL aircraft from the ground. 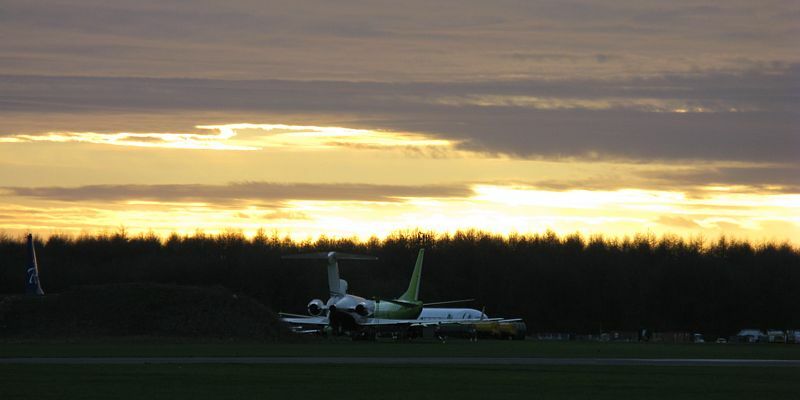 Some more pictures taken from the ground at Lasham Airfield. 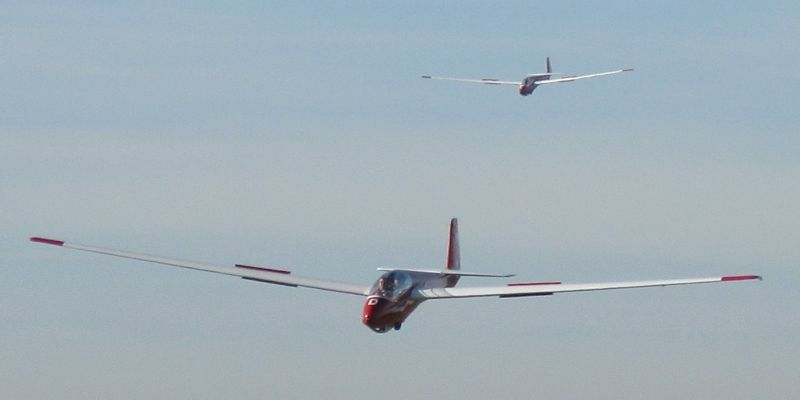 5 gliders soaring in a thermal. 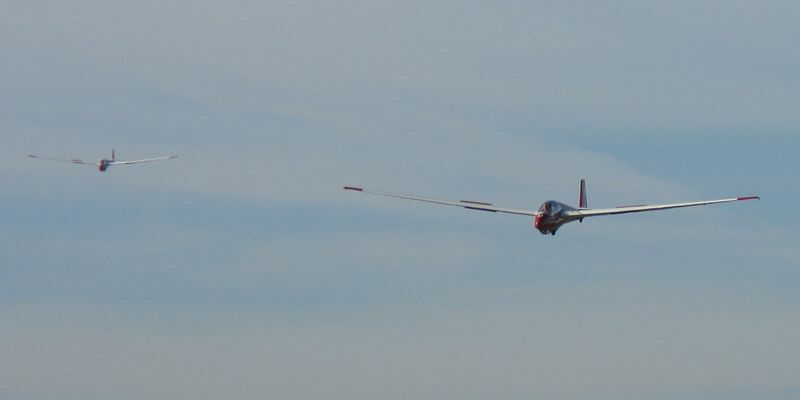 A Petrel vintage glider aloft. 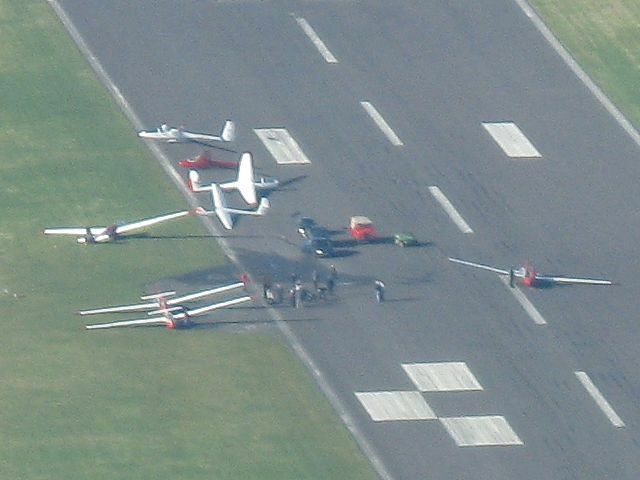 Today was the Lasham Grand Prix 2008 Public Day. Click here to see the Grand Prix pictures. 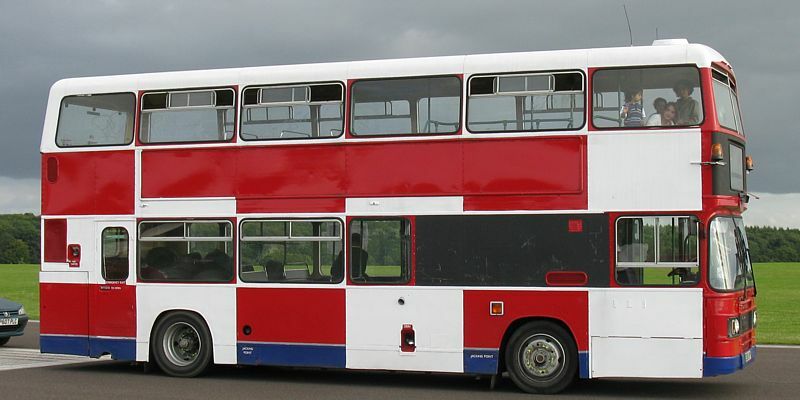 The new double decker launch point bus. 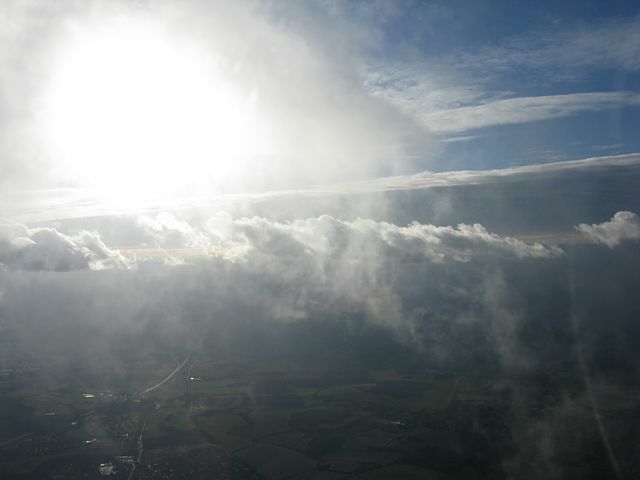 Aerotowing into sun late in the day. 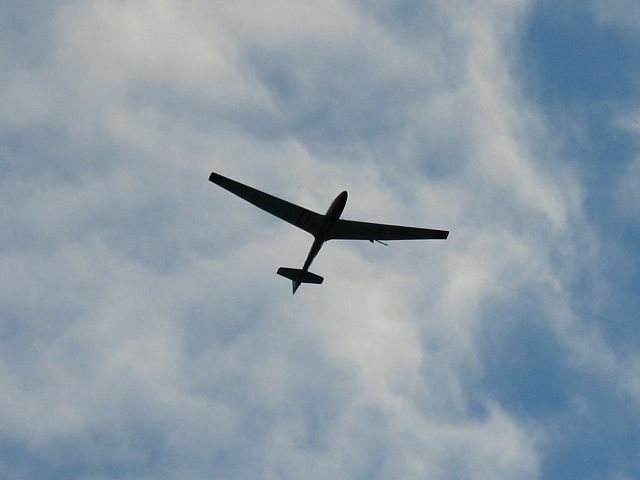 My best flight of the year! I had all but given up on 2008. But today I was lucky and grabbed the only Discus in the ballot. 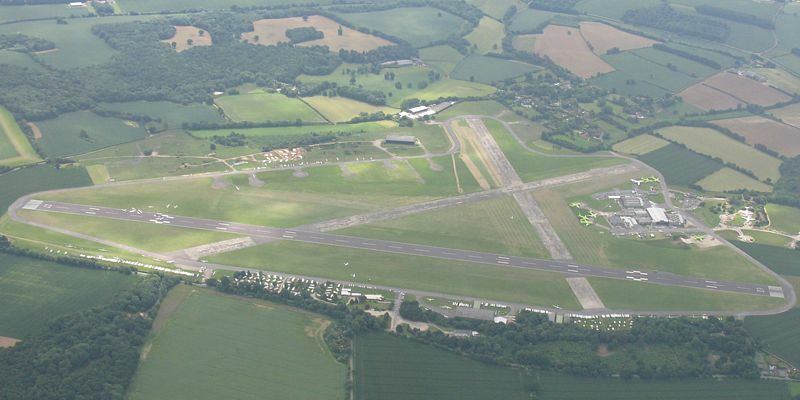 I then flew Lasham - Rivar Hill - Stony Stratford (Milton Keynes) - Husbands Bosworth - Lasham for 314km. It was my first visit to Hus Bos. 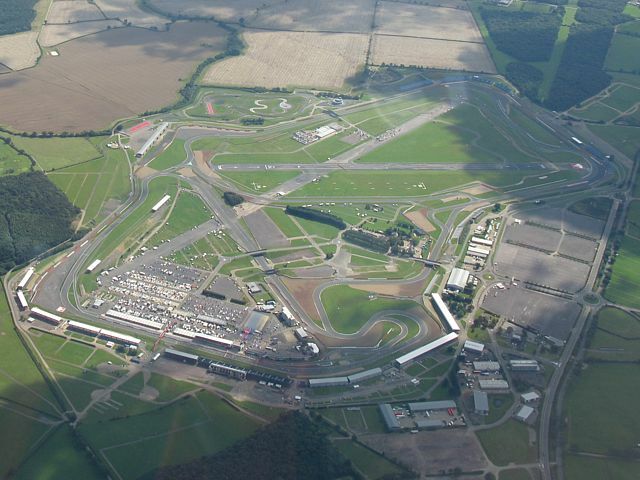 I also couldn't resist some new shots of Silverstone on my way home too! Approaching Hus Bos from the South. Hus Bos from the Southeast. 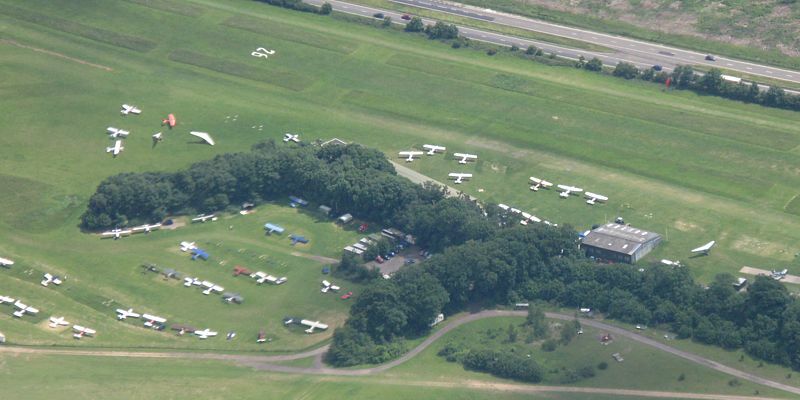 Looking down at the clubhouse area of Hus Bos as I turn HUS. Looking Southwest from Hus Bos. Stanford Reservoir at the bottom edge of the picture. 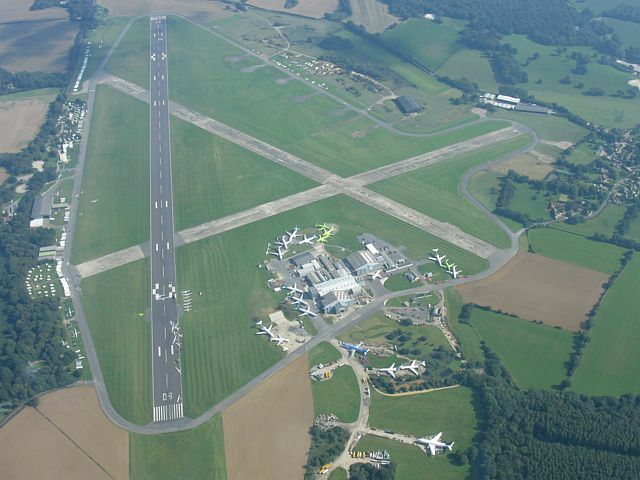 Lasham is 139km away to the South. 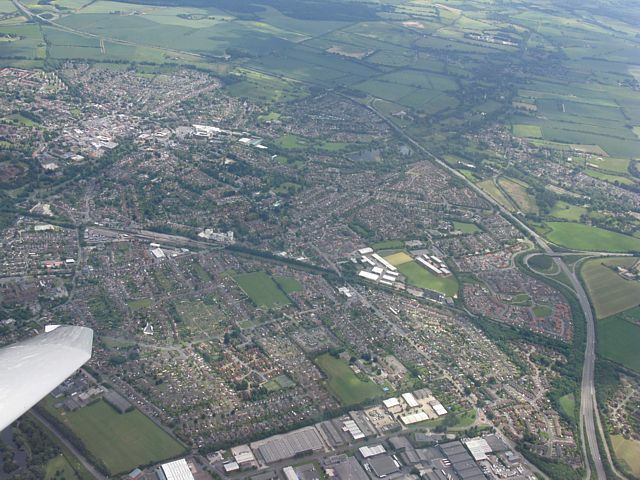 Northampton from the Northwest as I passed by from the North. Northampton South (NOS) turnpoint from the West. 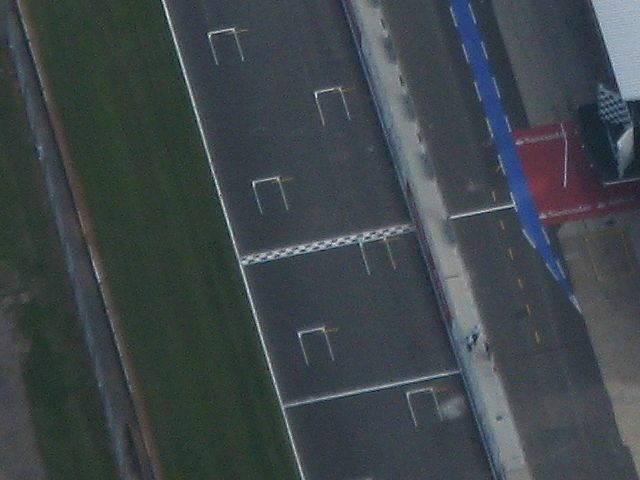 The finish line at Silverstone. 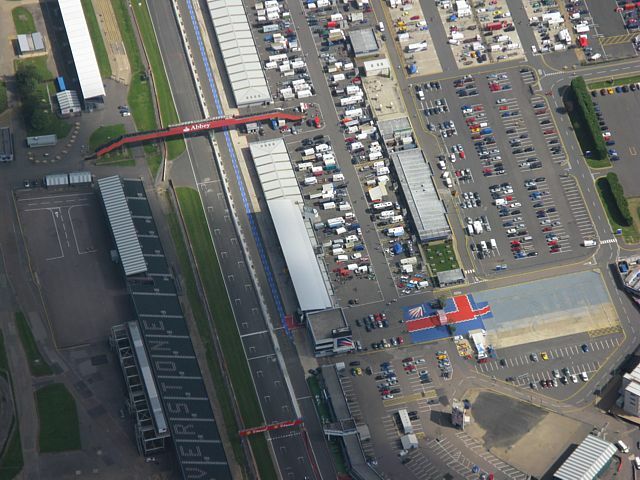 A zoom of the start grid and surrounding area of Silverstone. 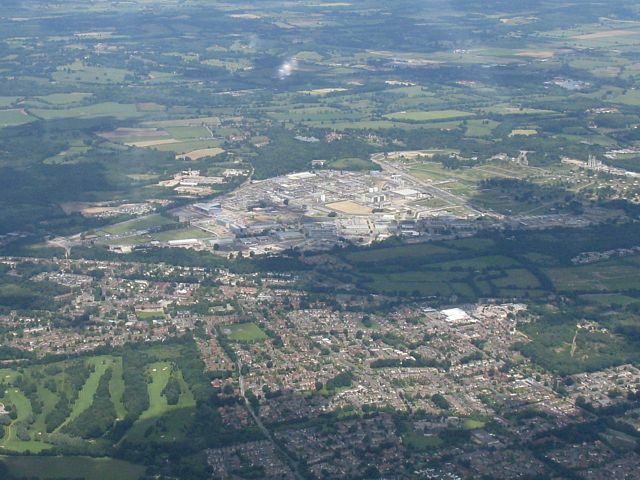 Silverstone from the North. 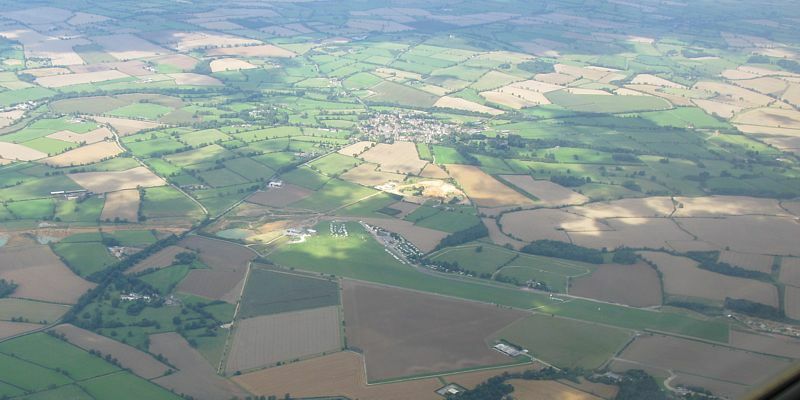 Silverstone from the South seen while soaring with another glider. 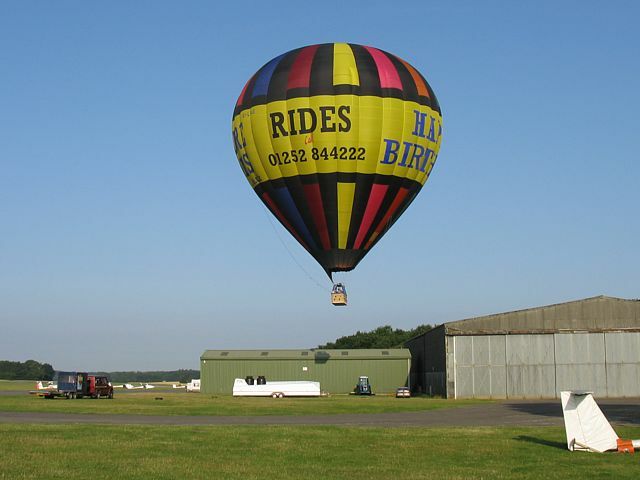 A balloon landed at Lasham early in the morning. 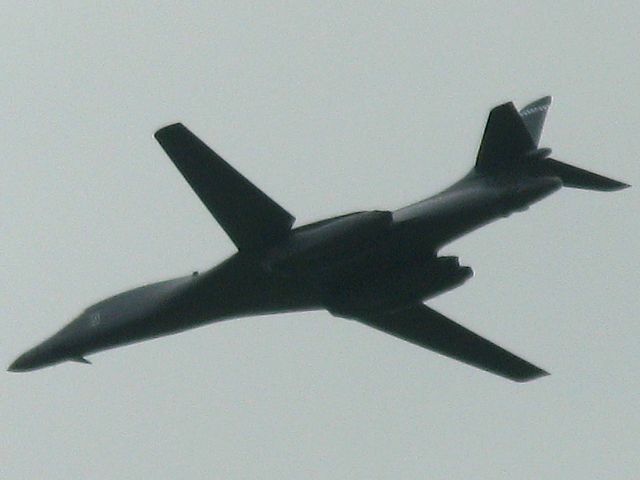 I first saw it below the tree line north of the airfield and road. 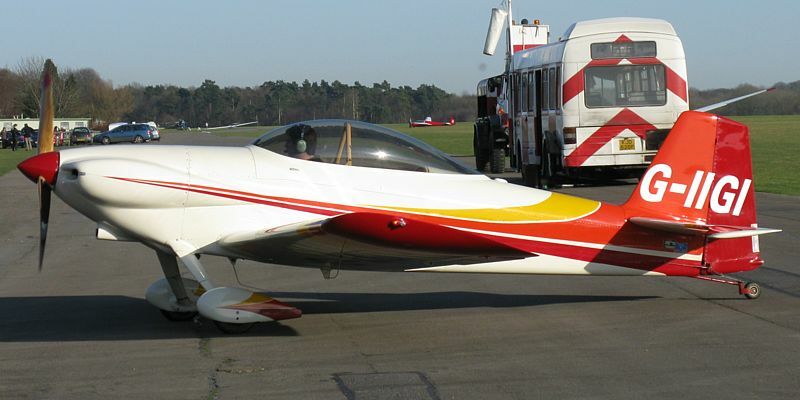 It then popped over the trees, then barely a few feet over the roof of the main hangar, then touched down just inside the peri track. 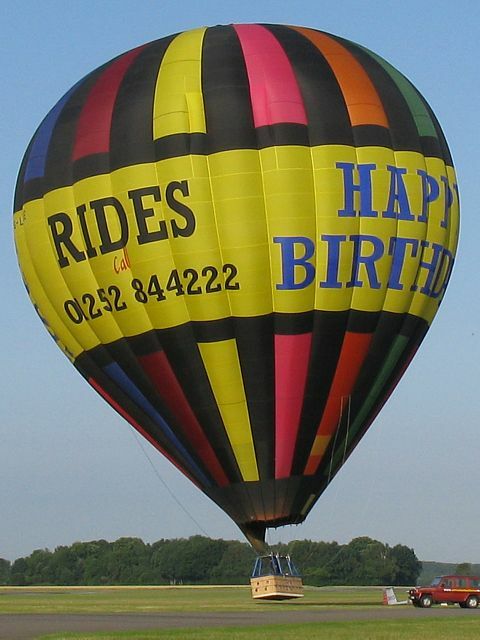 Balloon having just cleared the hangar. 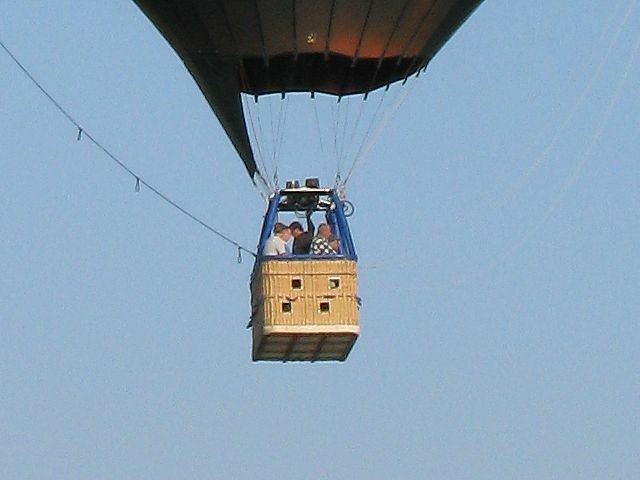 A close up of the Gondola (from same pic). 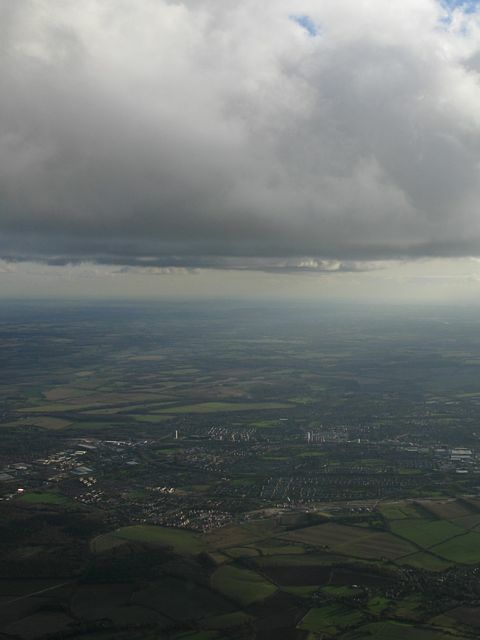 Wider view of the incoming balloon. Touchdown. 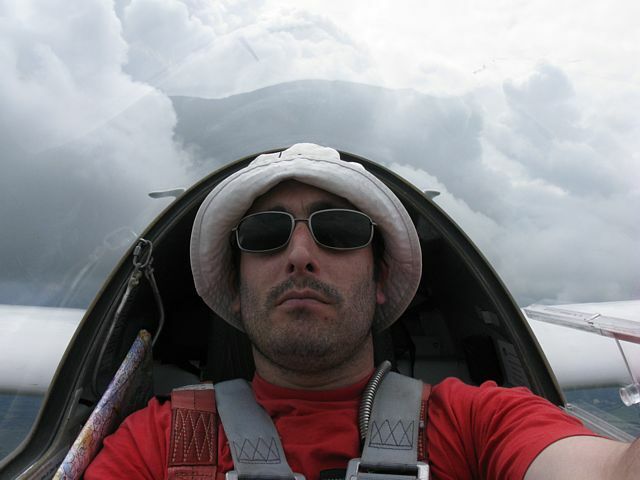 Another fun flight. A bit too much top cover. 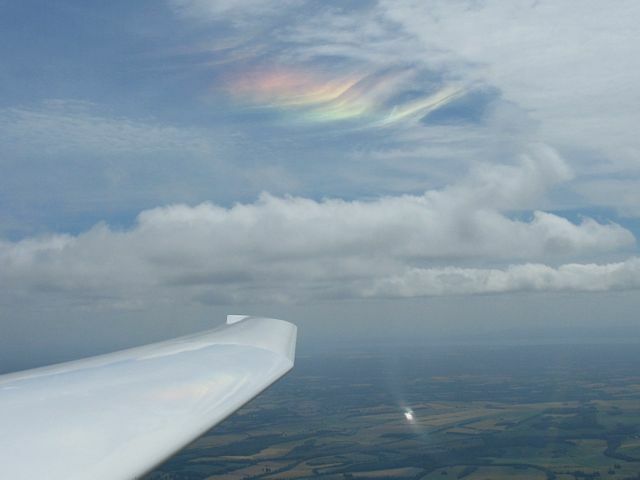 But cirrus above made for some beautiful coloured arcs as you can see. 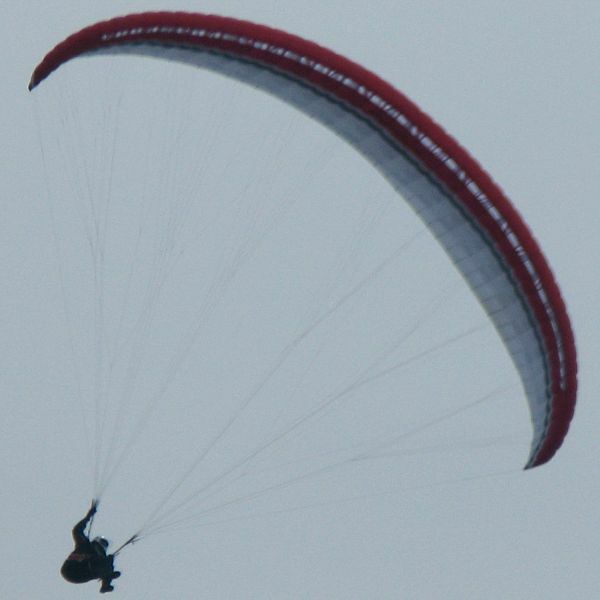 A distrail spotted before launch as thermals get going. 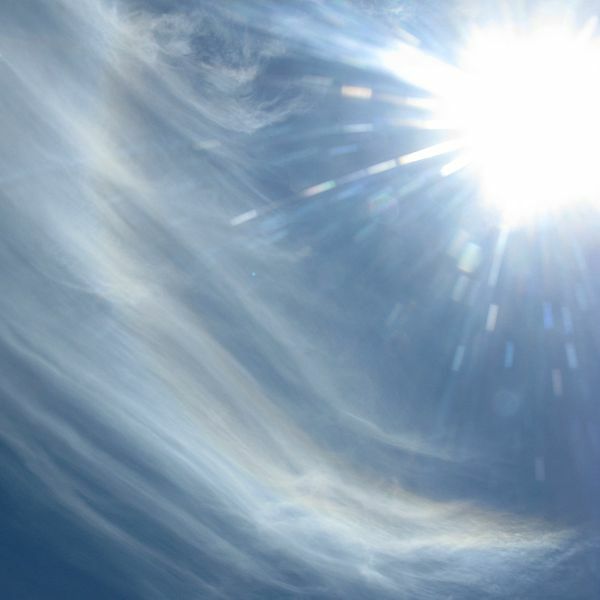 Circumscribed arc above the sun (up is diagonally top right) and part of a 22 degree halo. 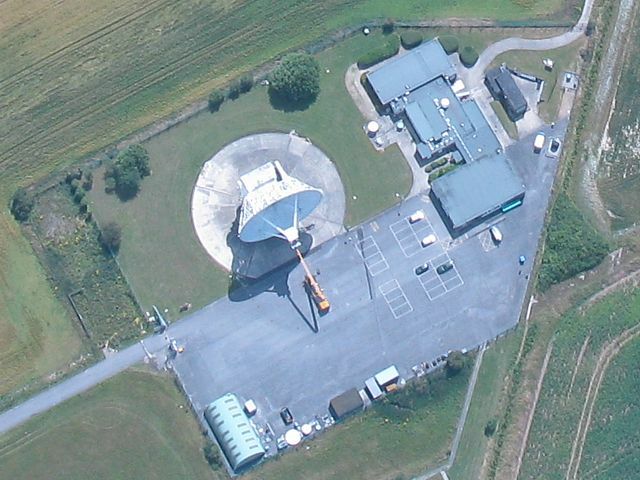 Chilbolton telescope undergoing maintenance? 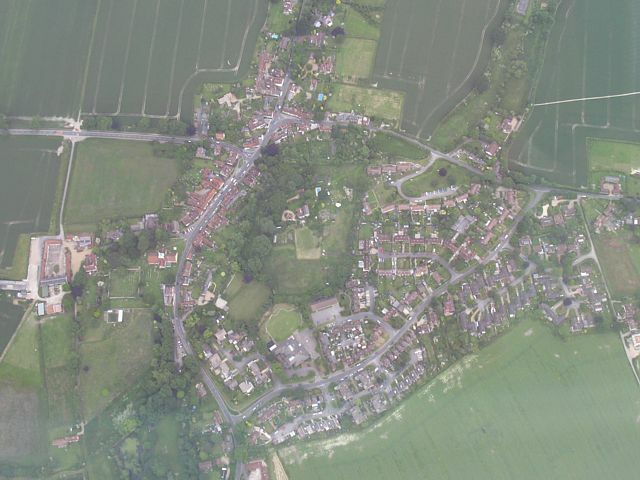 Pictures taken around Hurstbourne Tarrant. 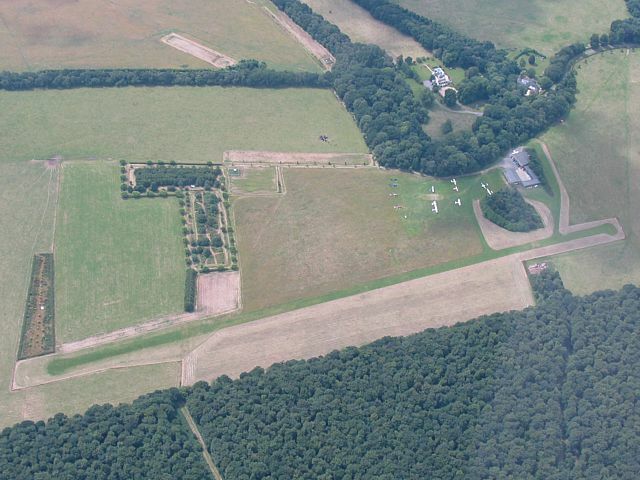 An air strip SW of Hurstbourne Tarrant, seen from the NW. 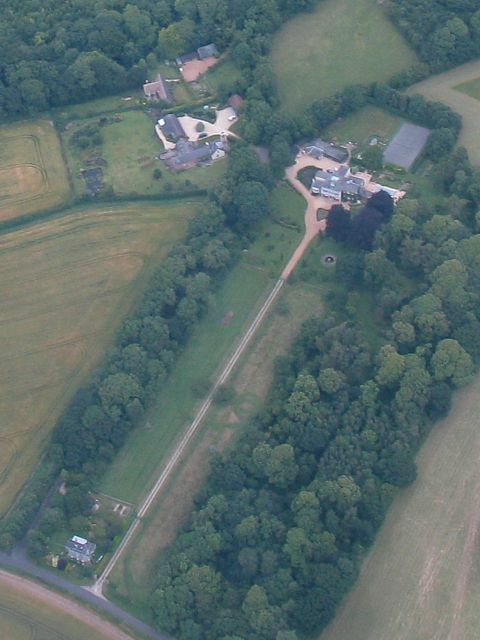 A mansion to the West of Hurstbourne Tarrant. 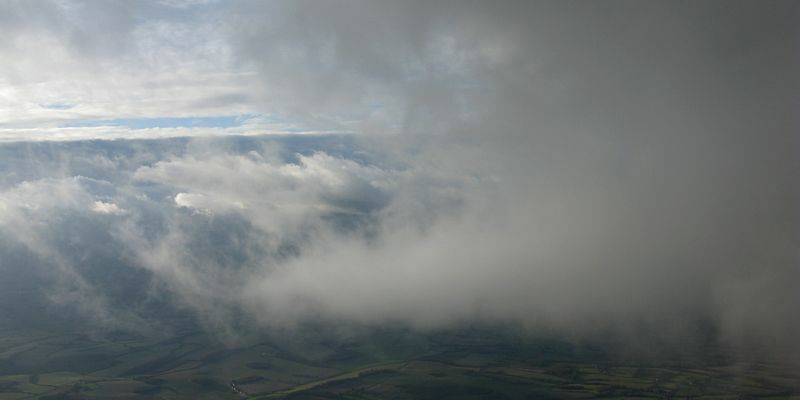 And Hurstbourne Tarrant from the SW. Paragliders thermalling with me under a cloud. 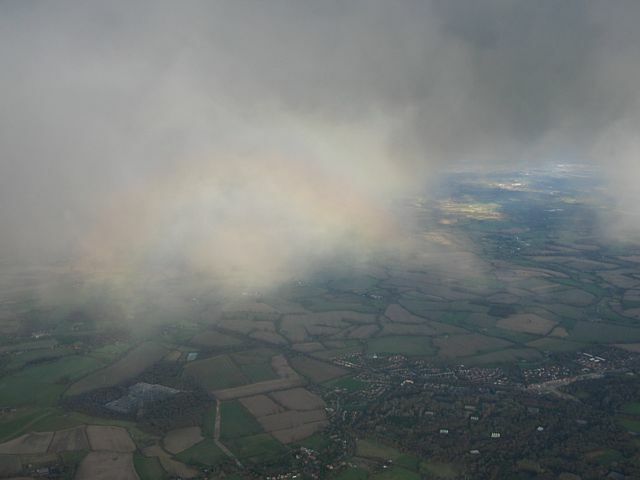 Somewhere near Bullington Cross just after 1pm I saw the most amazing patch of colour in a cirrus cloud below the sun. 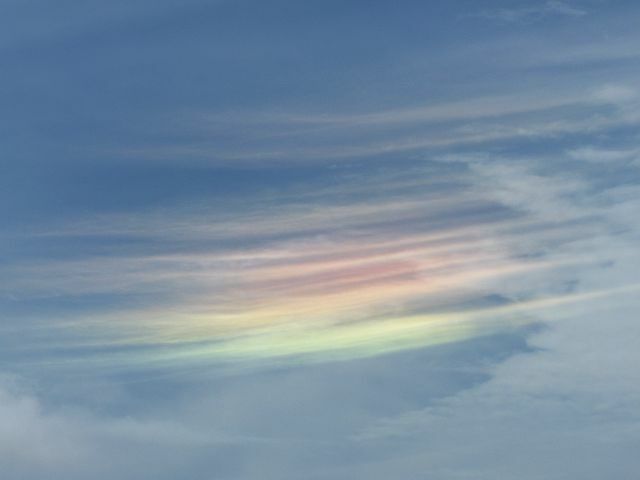 This is a circumhorizon arc, only visible in the summer when the sun is very high in the sky. 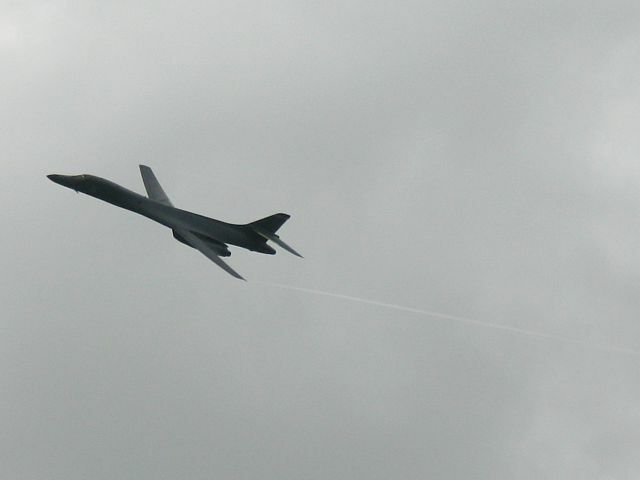 After landing, a B1-B bomber from the Farnborough air show did a low flyby of Lasham! At last! 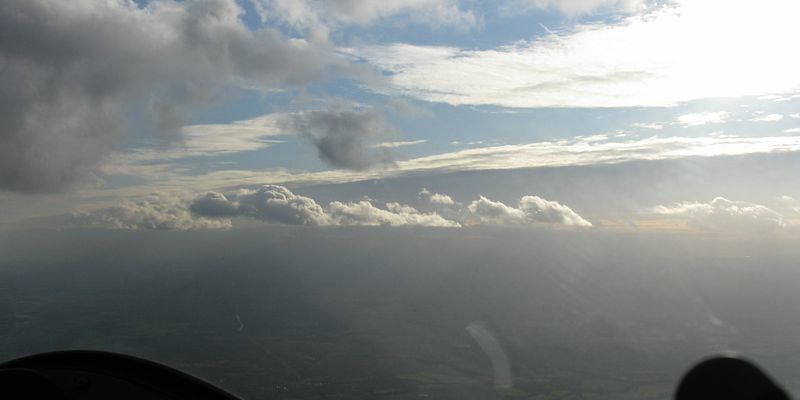 A decent cross country flight and good visibility. My first chance since February to test the new camera some more. I accidentally took all of today's shots using ISO200 resulting in a bit of graininess but I think it's barely noticeable after resizing. The pics still look pretty good and the extra resolution is a big boon! 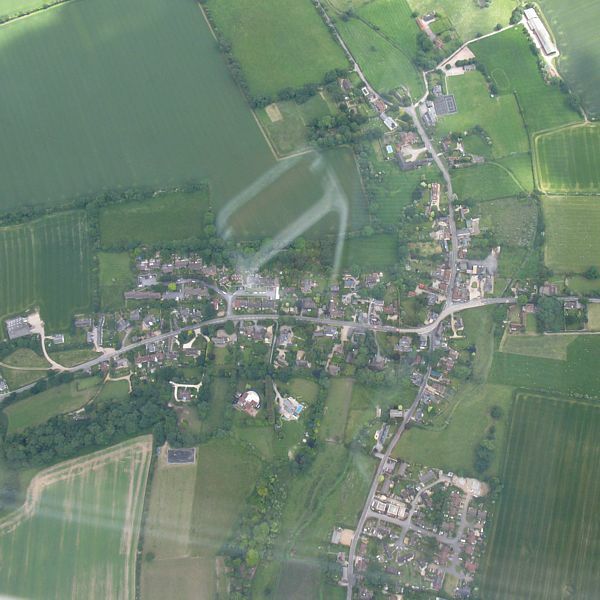 Two views of Oakhanger from cloudbase over Alton, processed from the same photograph. The resolution means I can see details not before possible at the same distance with the old camera. 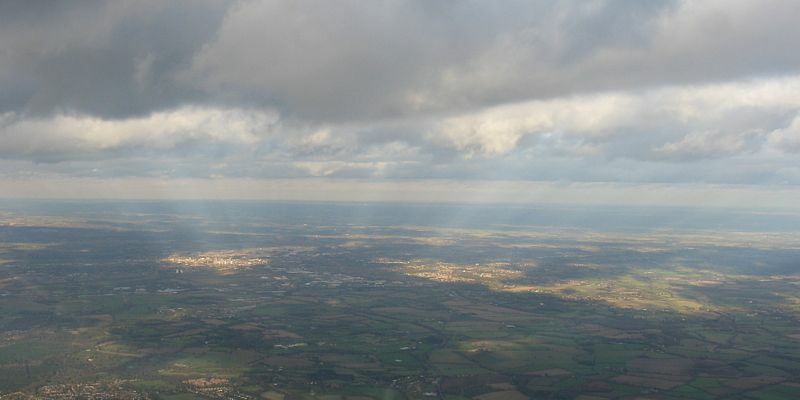 Looking towards the south coast under increasingly overdeveloped skies. 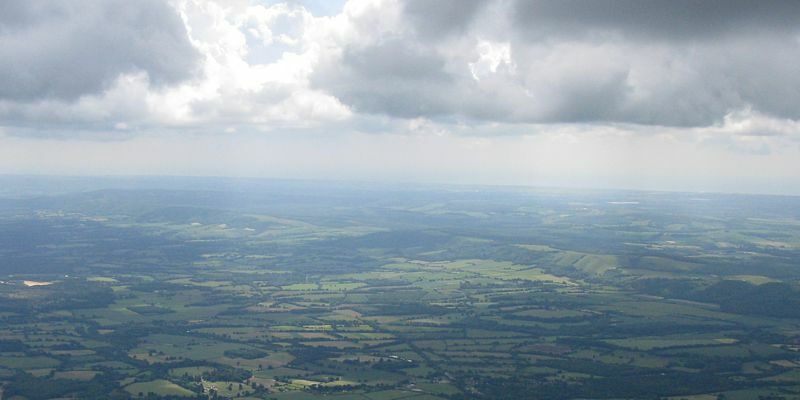 The South Downs ridge as seen from near Petersfield. 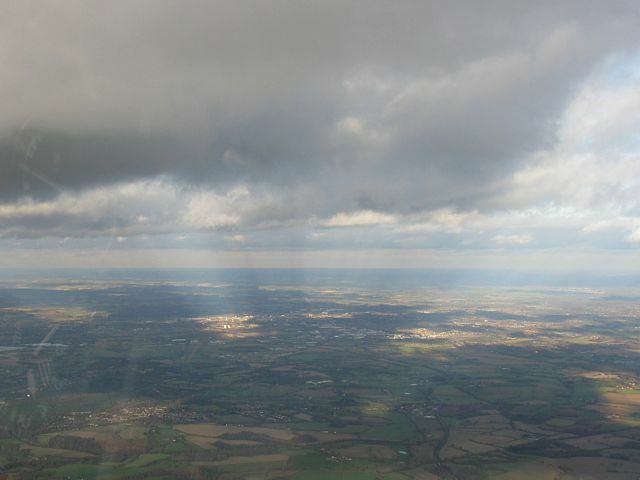 The South Coast seen through low bits of fractus as I approach Harting. 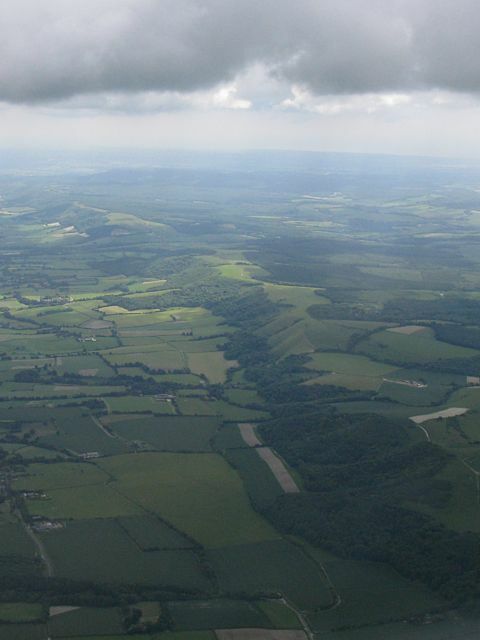 Looking East along the South Downs ridge from Harting. 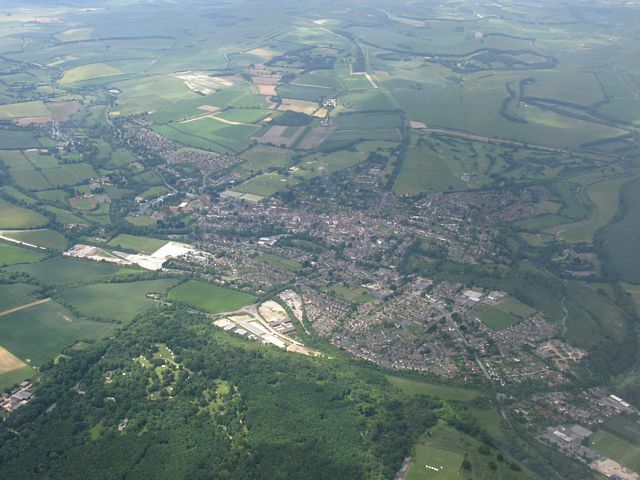 Two pics of Harting derived from the same photo, from the South. 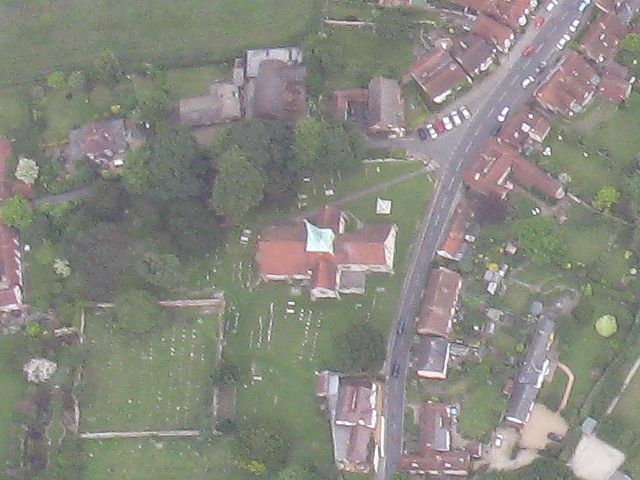 The 2nd zoomin centres on the church which represents the BGA turning point 'HAR'. 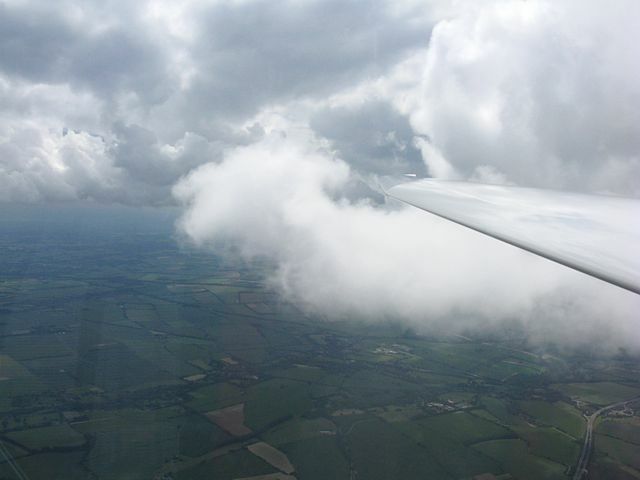 Soaring with 620 as I rescue myself from a low point near Petersfield under the local overcast. 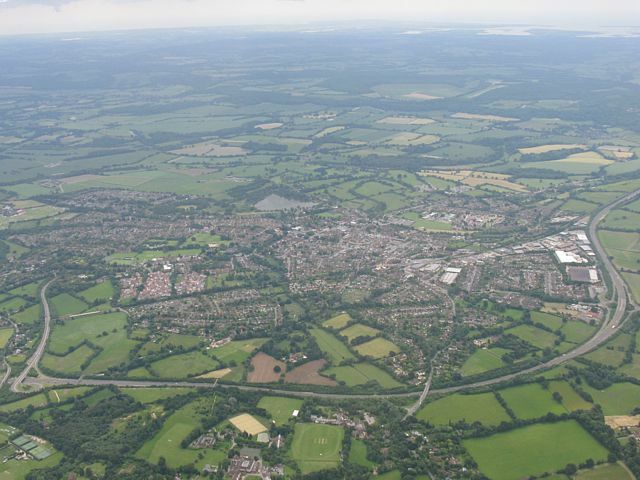 Petersfield from the Northwest, mercifully getting smaller after an urban thermal rescues me from my low point. 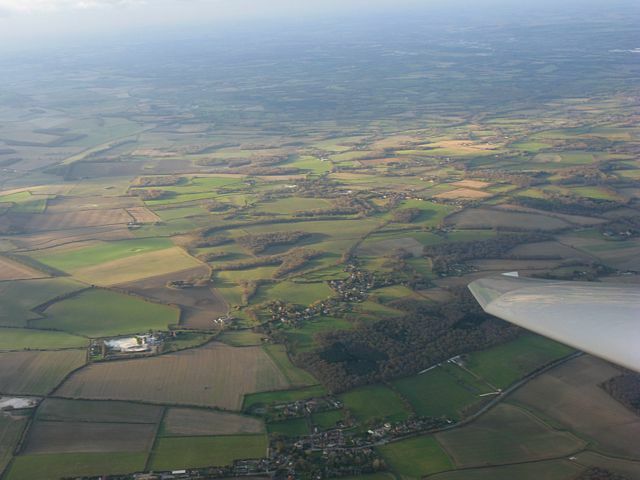 Heading north back towards Lasham. Beyond this dark area is more open and better sky. 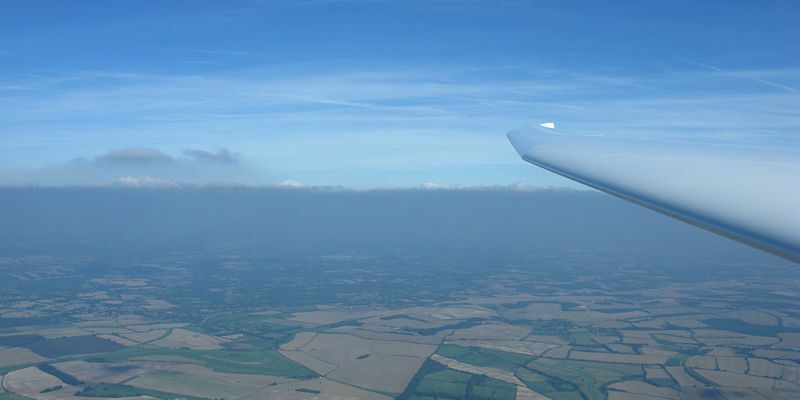 Some scruffy oik in a Discus leaving that dark mass of cloud at cloudbase and headed for better skies. 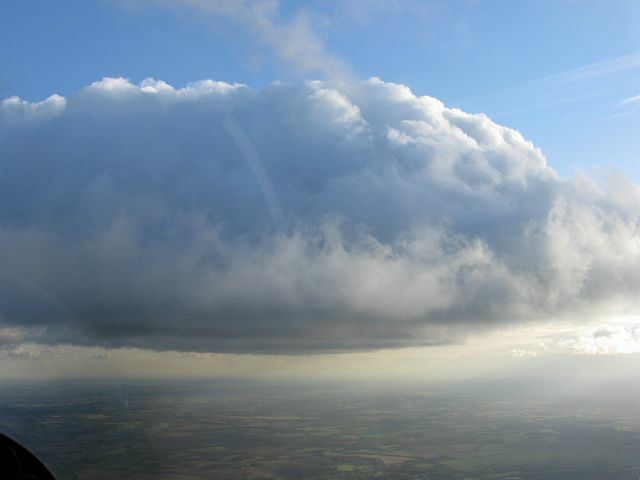 Decaying cumulus with its spreadout still distinctive in the moist layer, looking like a mushroom as a result. 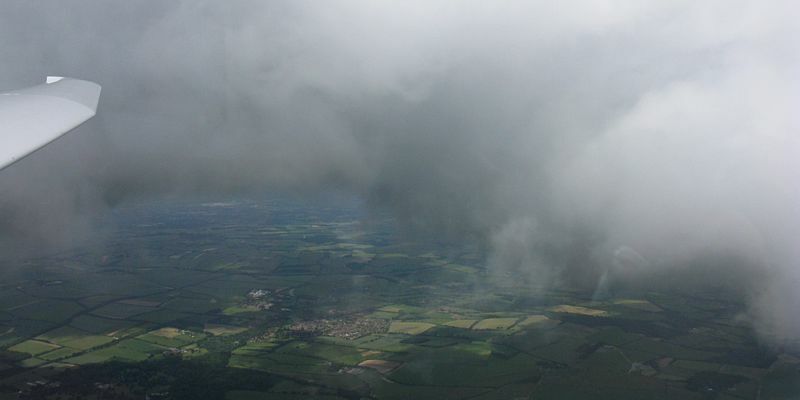 A couple of cloudshots as I go past Lasham. 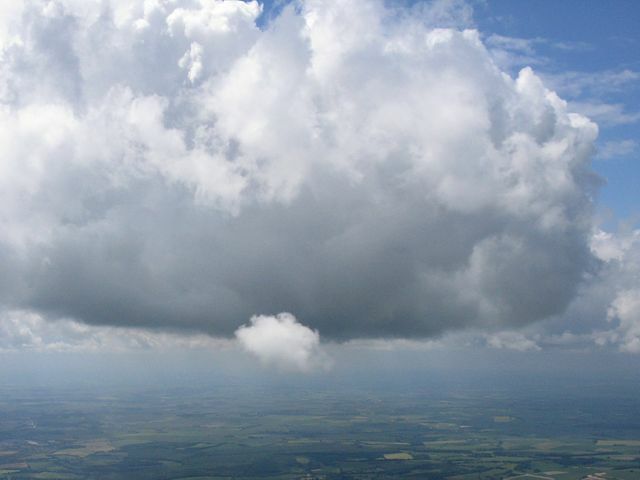 Note how the cumulus is interacting with the moist layer above. 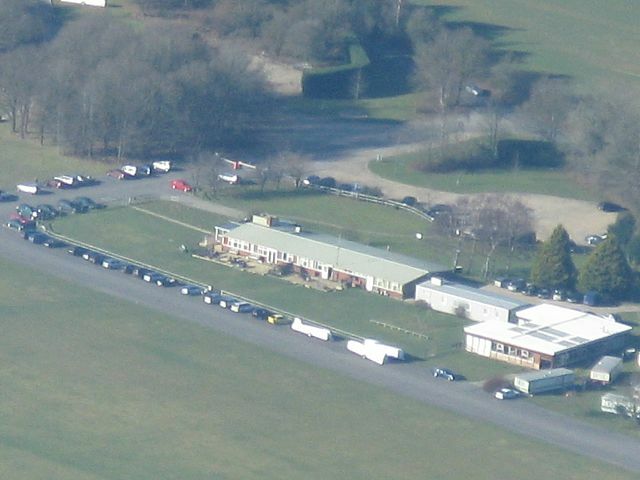 The customary view of Lasham airfield from the North. Both shots derived from the same photo. 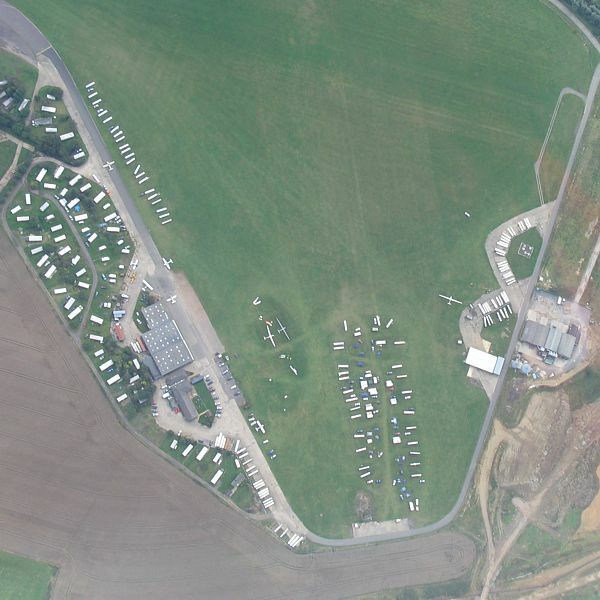 The second shot shows the brand new caravan site on the South side, as well as the site for the proposed hangars. 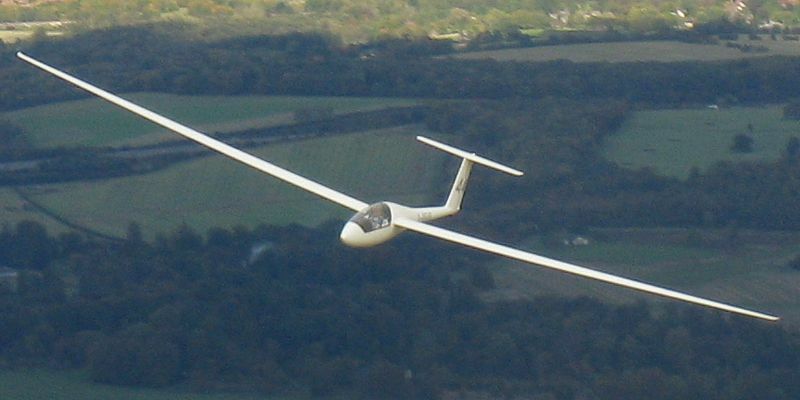 Soaring with glider EKP just north of Basingstoke. 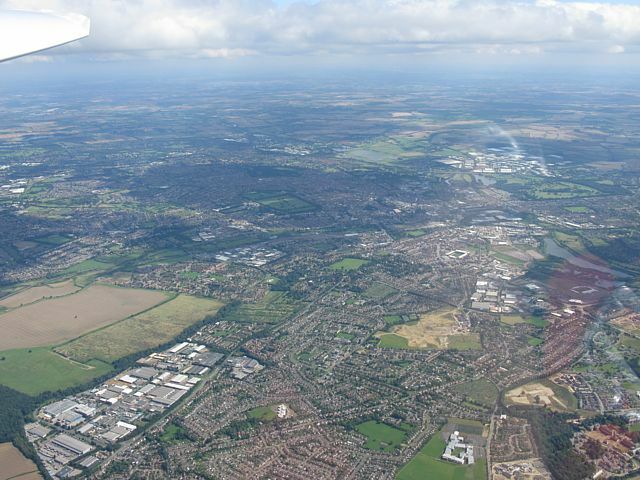 Passing Aldermaston on my way to Newbury. 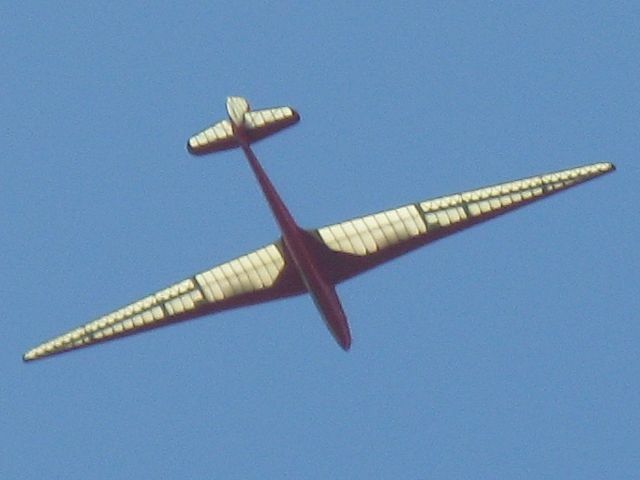 In the same photo a glider can be seen. 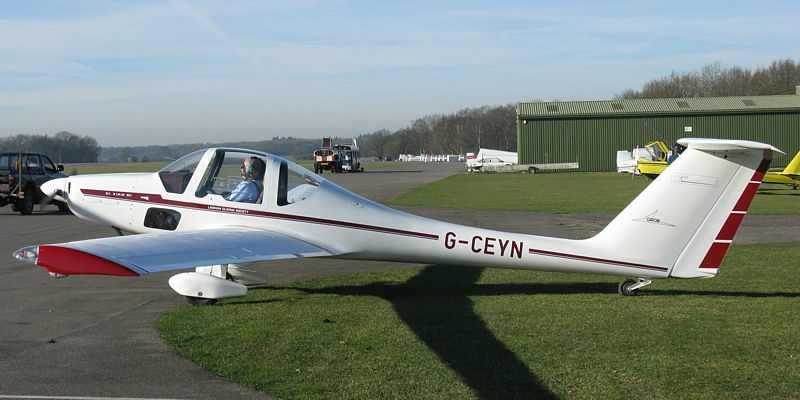 From this angle Brimpton is just in front of the glider. 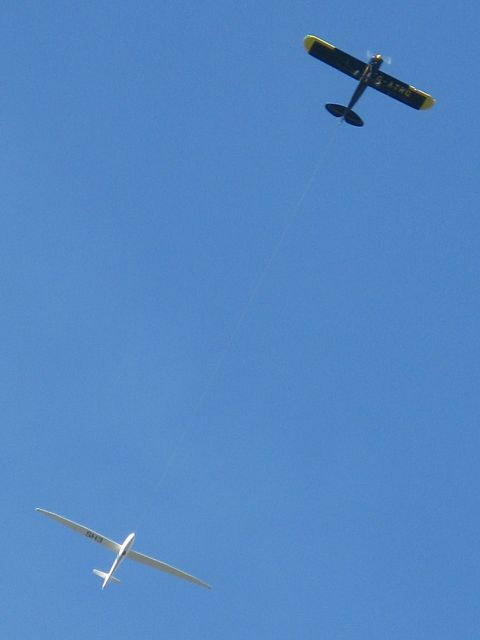 But in reality the glider is almost certainly clear of airspace. 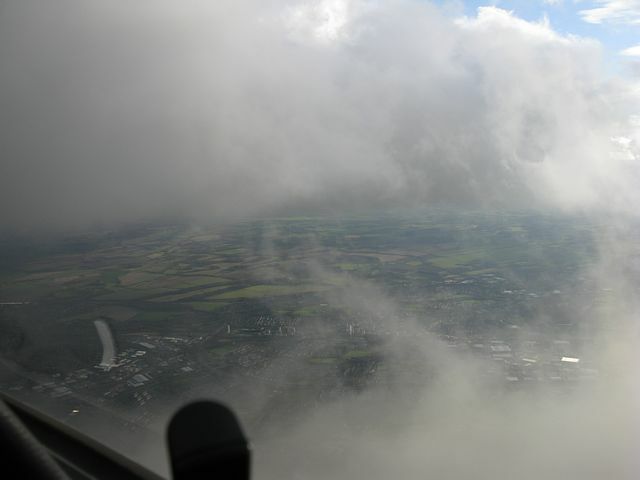 Back to cloudbase over an industrial area on the Eastern end of Newbury. 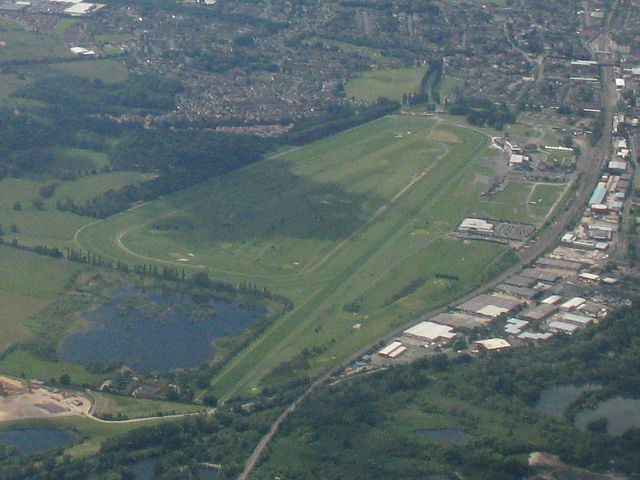 Looking down at Newbury Racecourse (BGA turnpoint 'NEW') from cloudbase. Both shots derived from the same photo again. 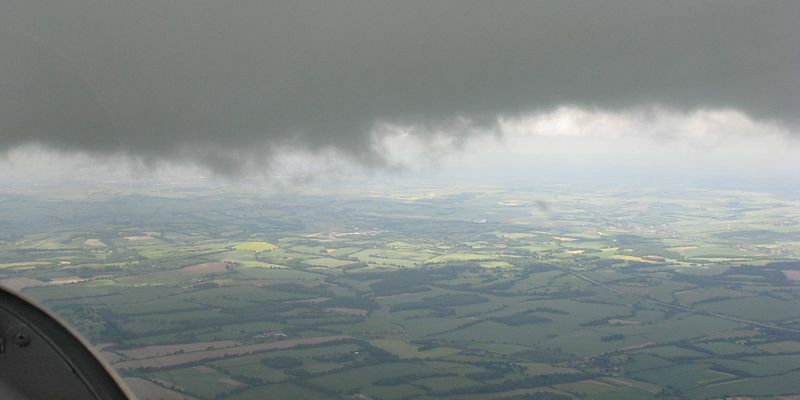 Cloudbase now quite variable. Under the dark streets the scraggier bases are well below the main base at the sunny edges. 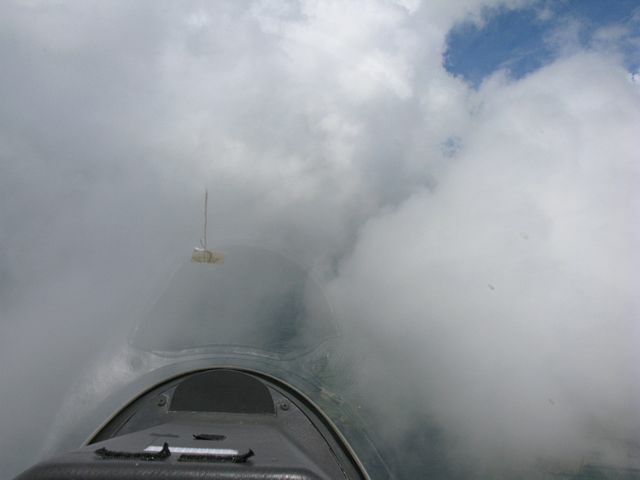 Diving under some of the darker lower cloud. 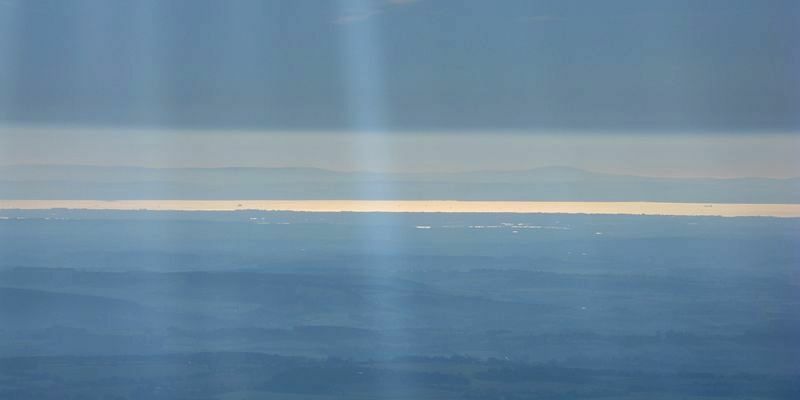 Sunlight getting through a huge gap to the north. 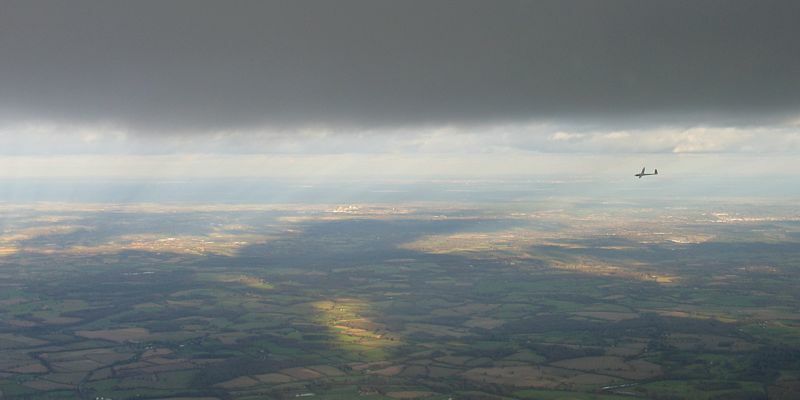 Passing Hungerford in the dark cloudshadow of the monster street I'm following. 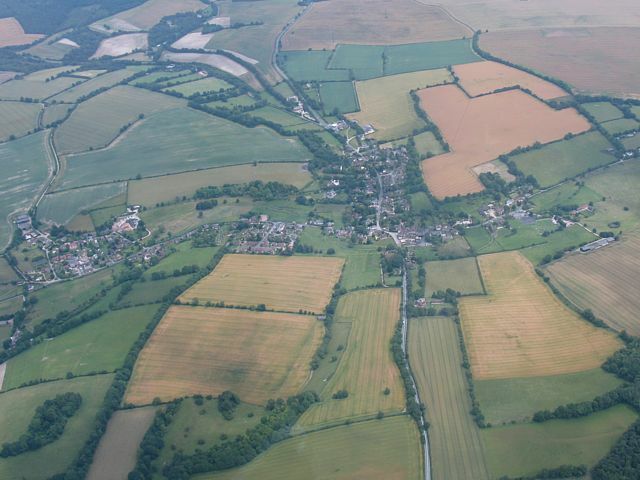 Marlborough from the Southeast. I got here from Newbury without turning. 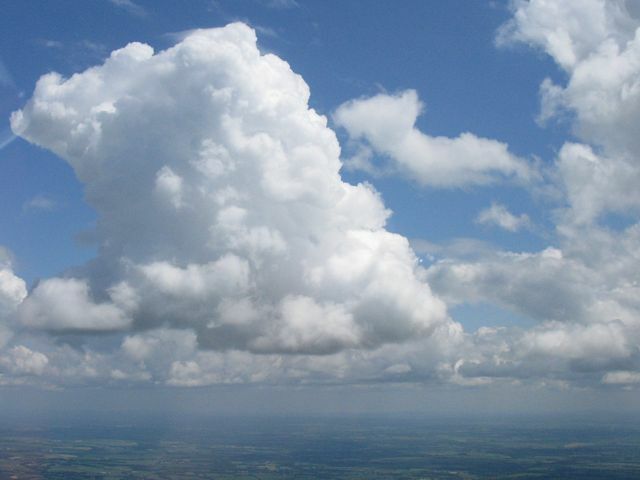 Just followed a huge bloated cloudstreet. Burbage from the north. 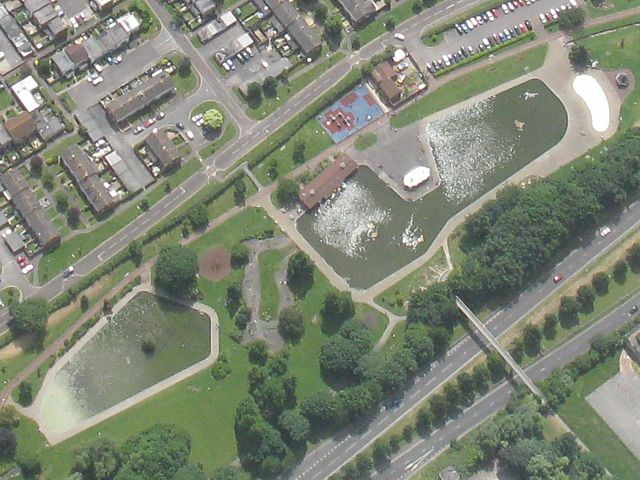 The 'BUB' turnpoint is the big roundabout at the far (Southern) end. 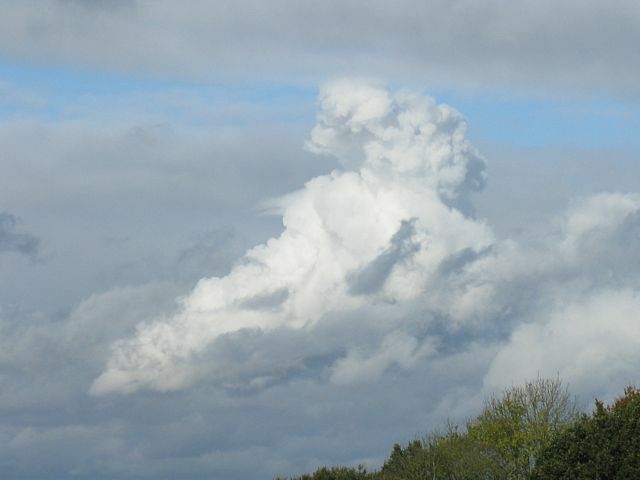 Is that some ghostly cat knocking on the bigger cloud with a hammer? Is that a giant also wielding a hammer? Or an axe? 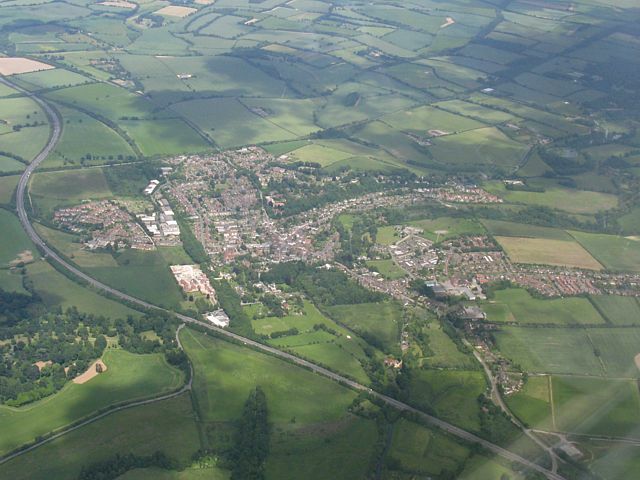 Andover looking South. 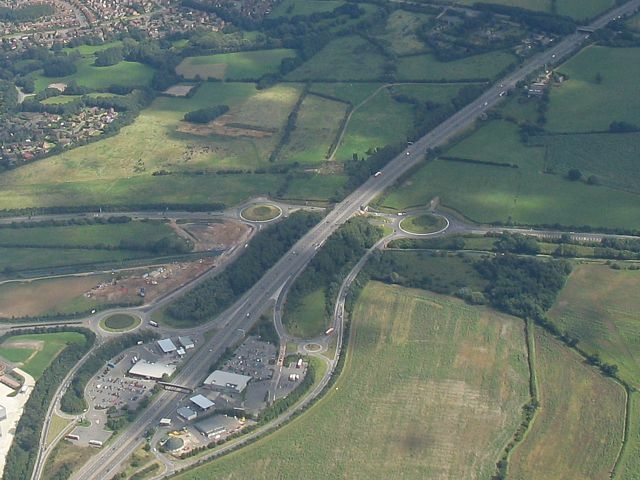 The giant roundabout on the right is the turning point 'AND'. 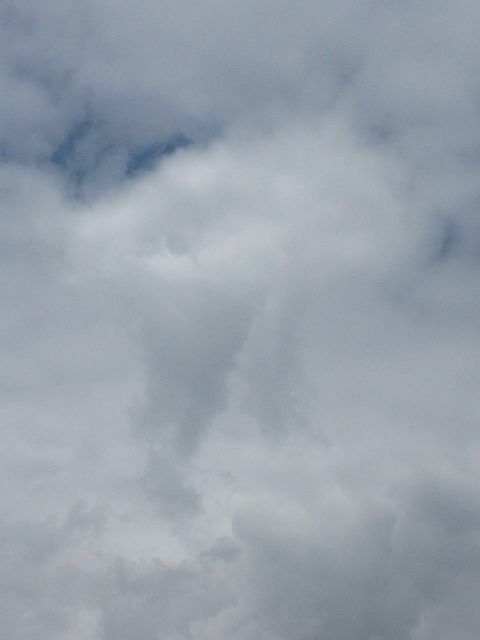 Is that a winged spectre holding a giant club? 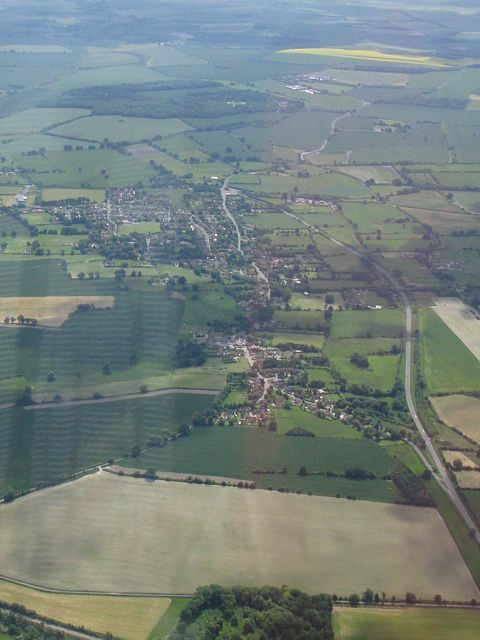 Whitchurch from the Southwest. 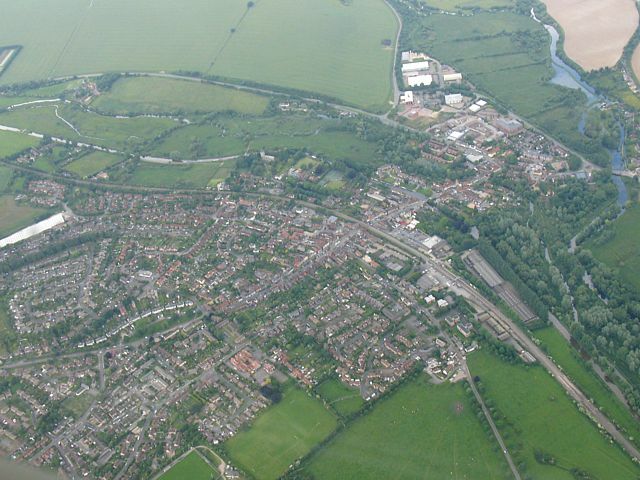 The turning point 'Wh2' is where the big road crosses the railway near the left edge of the shot. 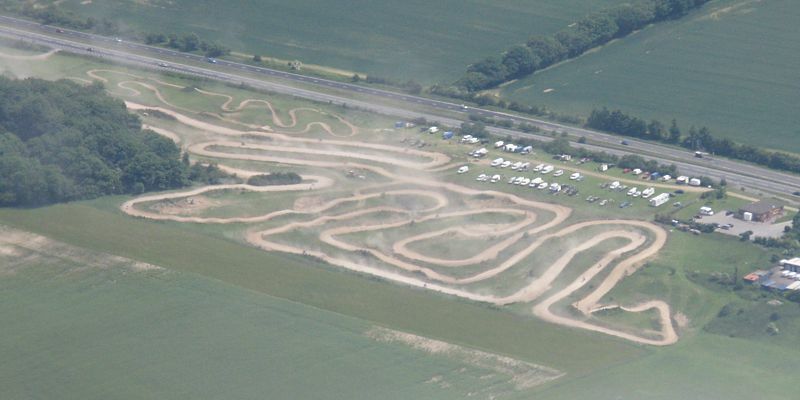 A race in full swing on a dirt race track just East of Popham airfield. 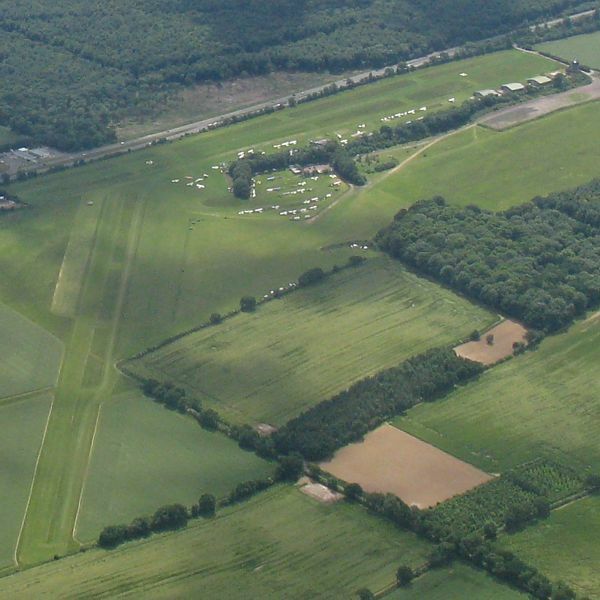 A closeup of Popham airfield from the Northwest. 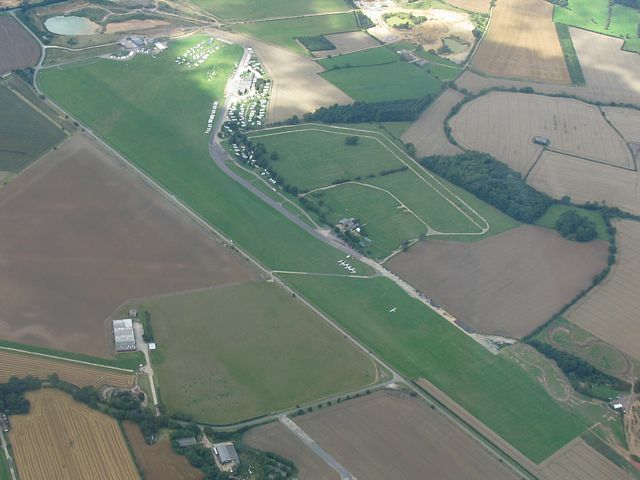 The whole of Popham airfield from the Northeast. 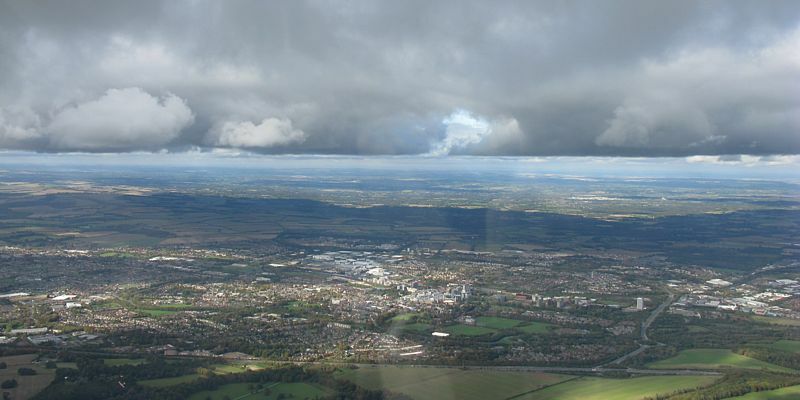 A huge cloudstreet over Basingstoke. 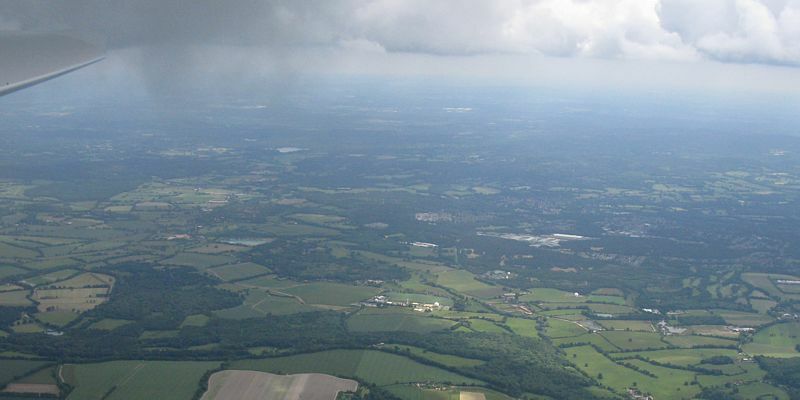 Looking Northwest under a light shower in the huge Basingstoke street. The pic doesn't show it well but the ripples in those Basingstoke ponds were quite dazzling. 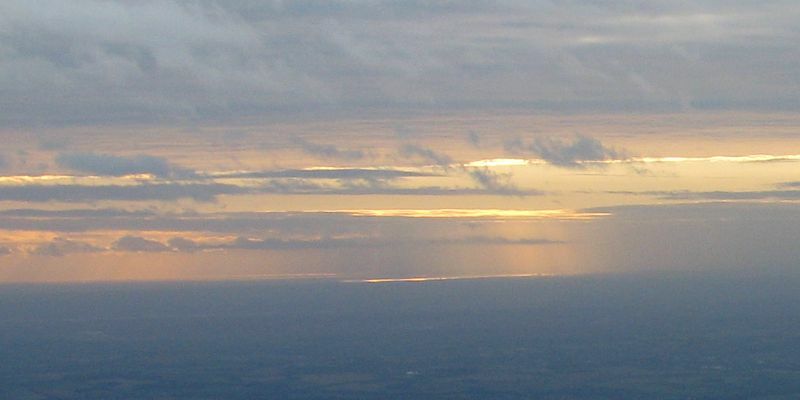 More variable cloudbases. 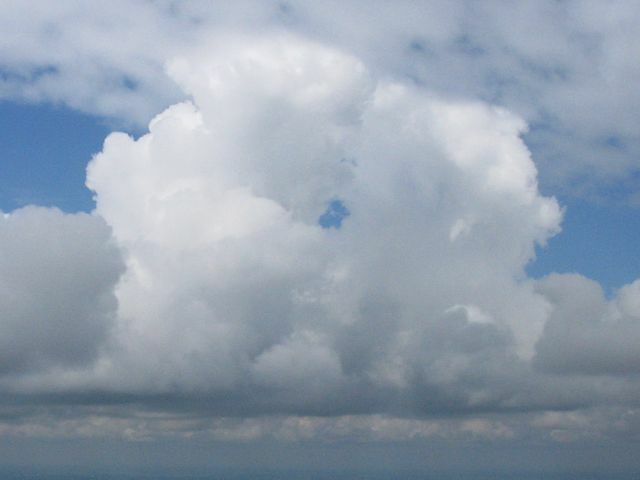 A tiny puff of cumulus accompanies a much larger and darker companion. HurstbourneTarrant from the Northwest. The turning point 'HUR' is the junction just right of centre. 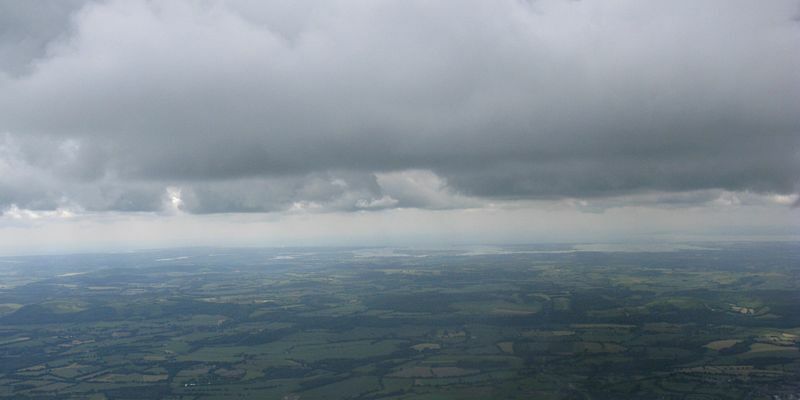 To the north of Bullington Cross the cloudstreet had a 700 foot difference between the lowest and highest cloudbases. 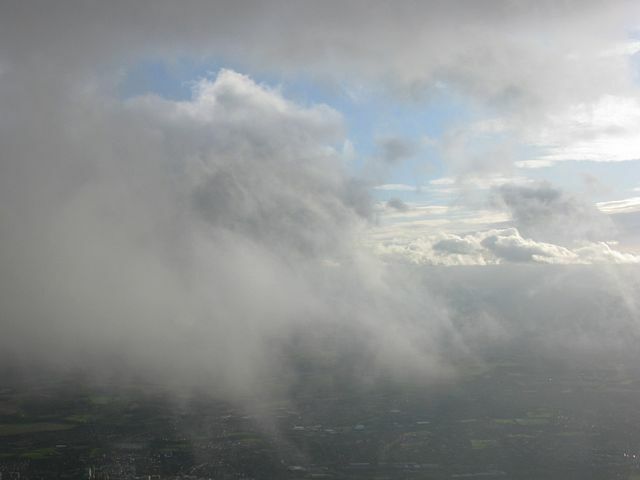 Climbing to the highest cloudbases gave me some stunning views! 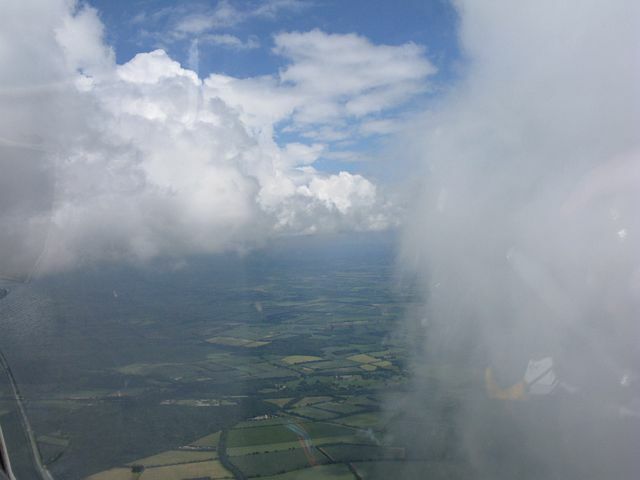 Squeezing through a clear gap between clouds and emerging from the other side. One last shot running alongside low clouds. 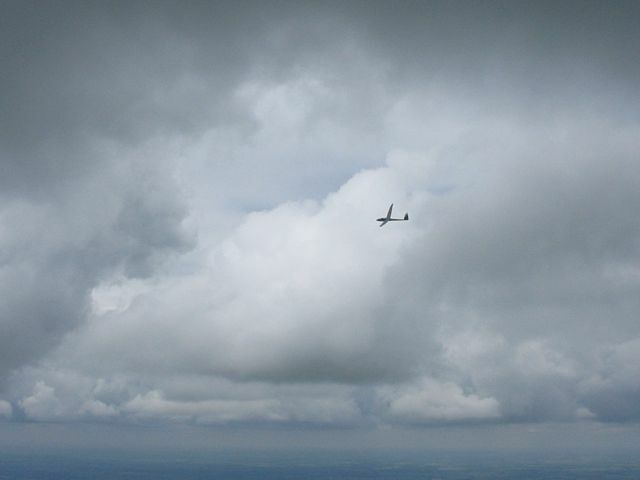 My new camera's first trip to Lasham and up in the air. 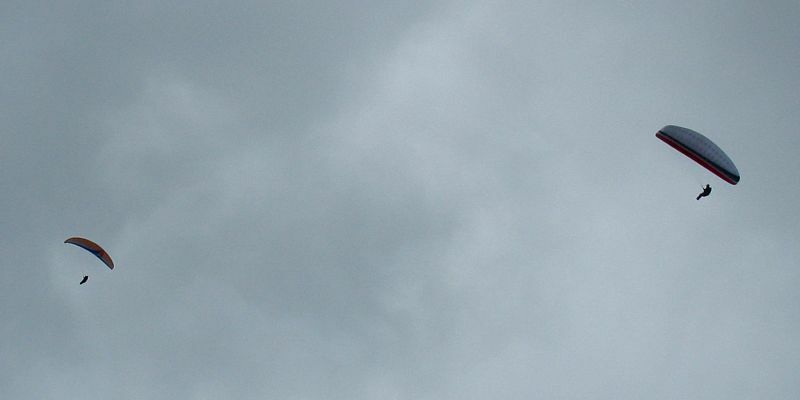 Needless to say I played with the 6x zoom to see what I could do with it. So far a mixed bunch of images. Some with more noise than I would like despite bright conditions and low ISO. But fairly good otherwise. My trusty steed for the day. 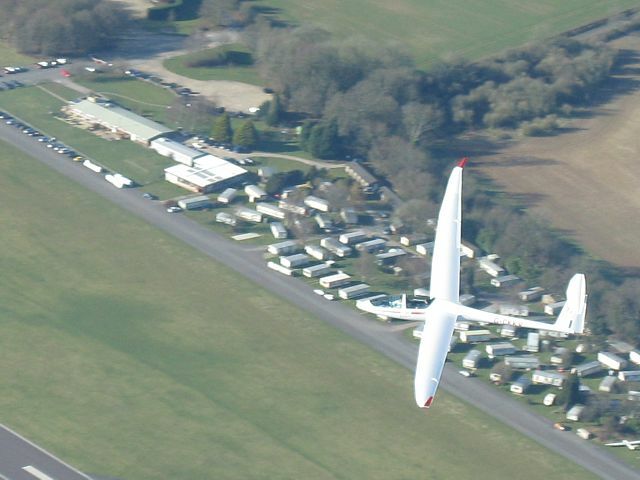 Lasham's brand new Grob 109. 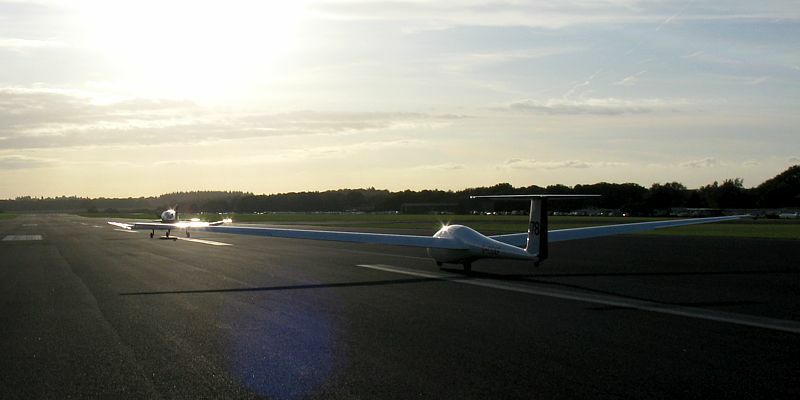 Two K13's landing together. 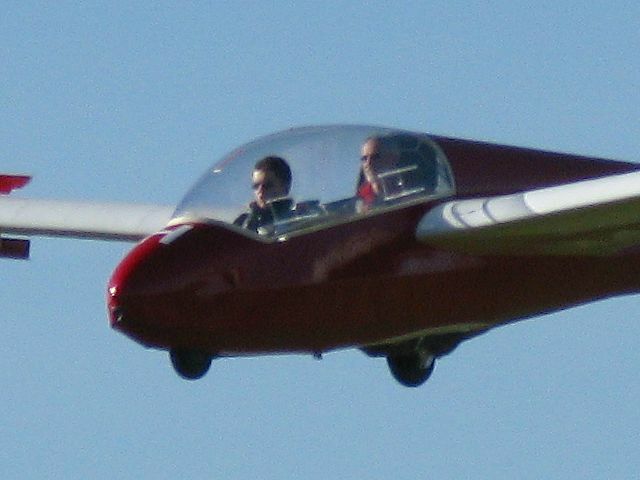 A landing Robin. 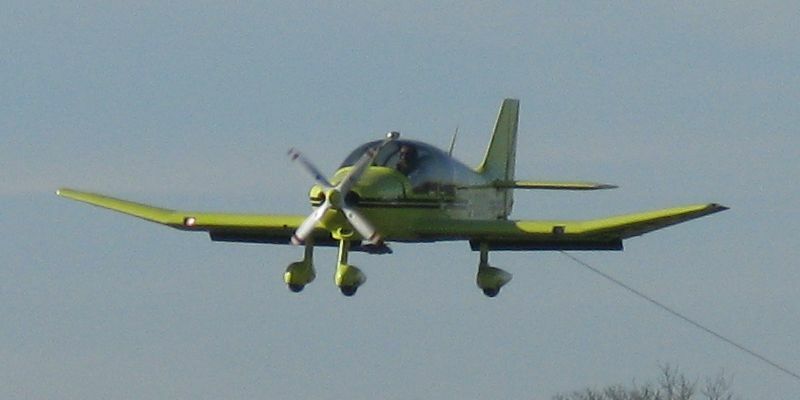 Using the 6x zoom on a K13 coming in to land. 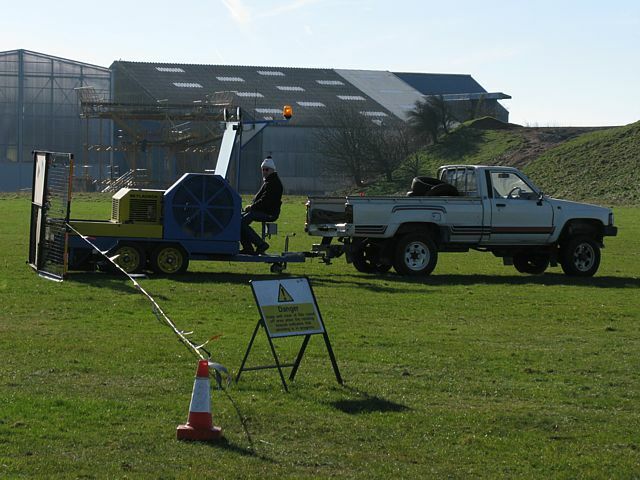 The retrieve winch. 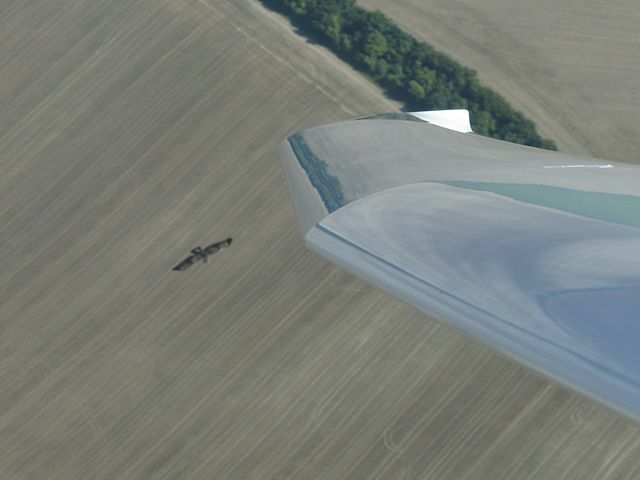 An intresting looking approach by a landing Cub. 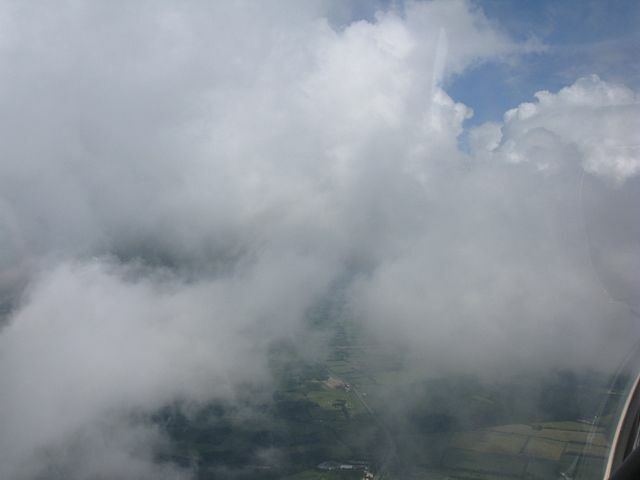 The winch from maybe 1200 feet up. 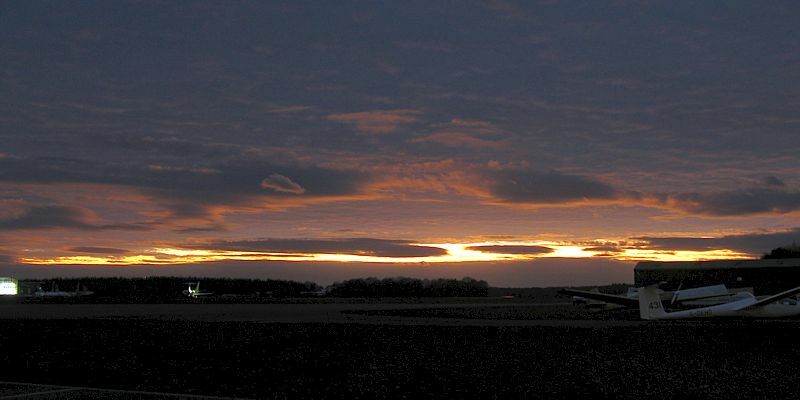 The refinery to the Northeast of the airfield. Testing the zoom again. The launch point from over a mile away. Plus a wider view. No launch point bus, as it broke down earlier in the day and had to be towed away. 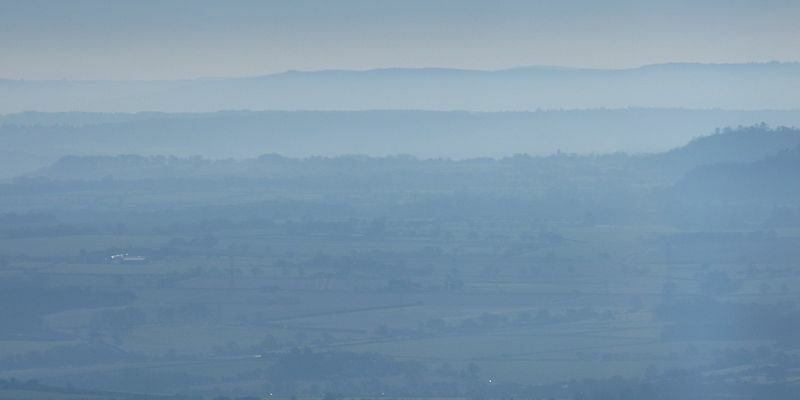 The viz was good, but to the south in the valleys it was hazy and misty. 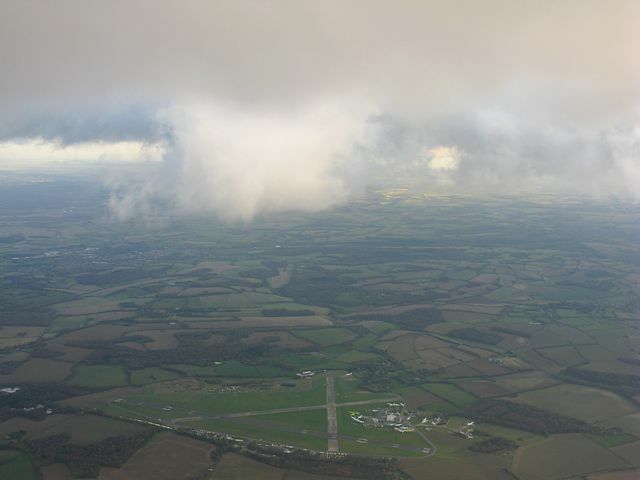 Lasham under a strong low inversion. (Looking NW.) While I paused for lunch someone took an aerotow in SH3. I caught the moment he released from tow too with the rope falling away. 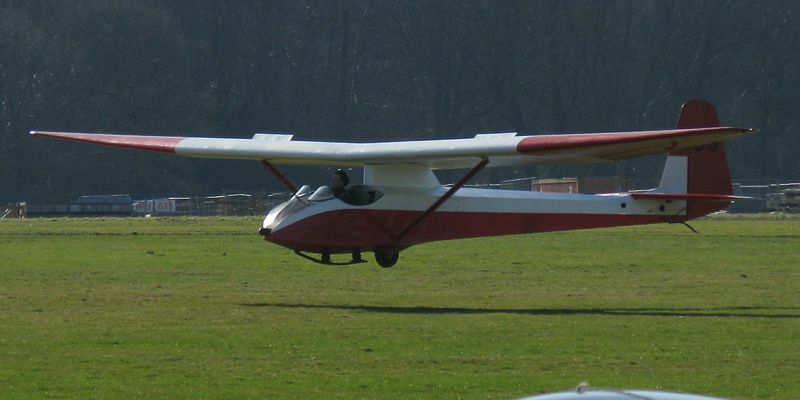 T21 landing. 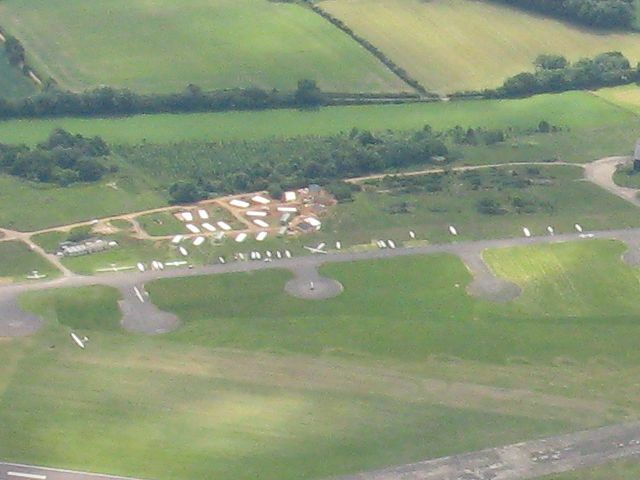 ATC Lasham from aloft. The clubhouse. I can see my car. 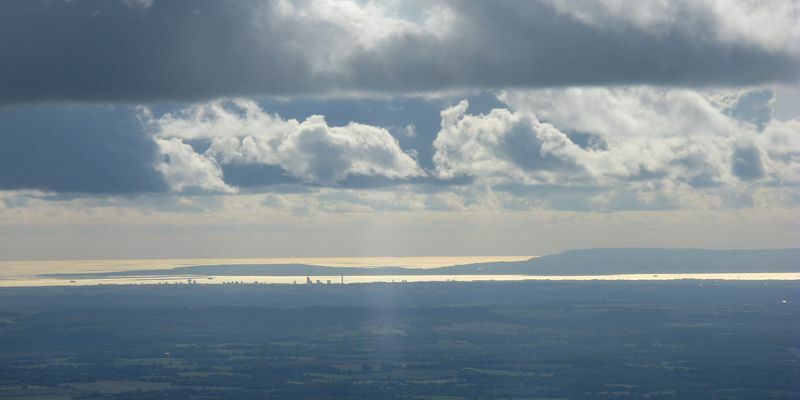 :) Looking South through lens flare at the solent, misty valleys and that strong inversion. Looking down at 776 as we circle together. Lucky shot but too much motion blur. 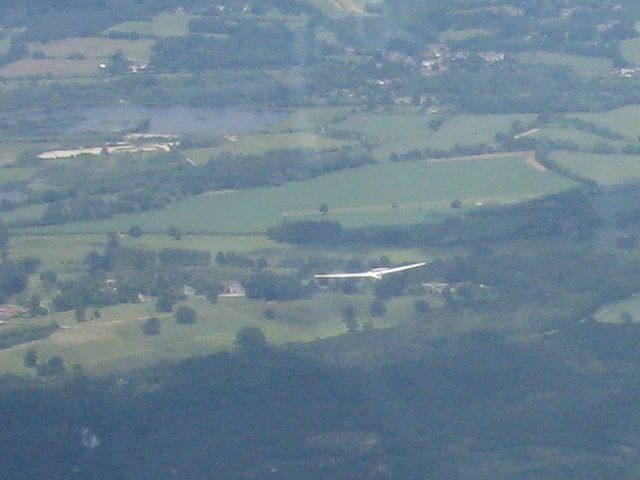 If only I'd got it pin sharp... 776 flying past with the clubhouse visible in the background. 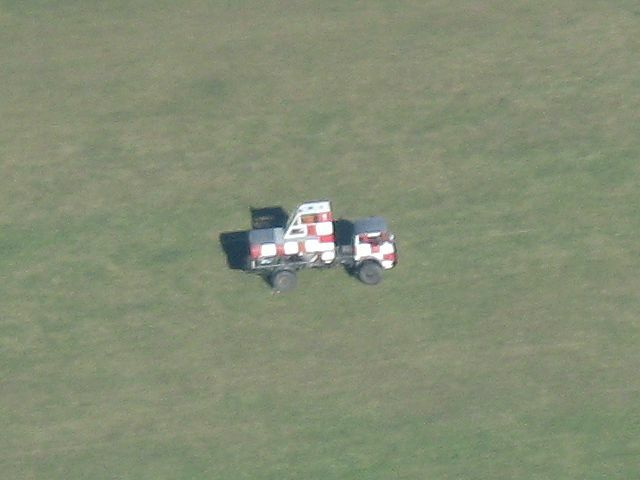 An interesting looking aircraft crossing the peri track between me and the broken down launch bus as I walk back to the clubhouse.